Isn't it dreamy?! 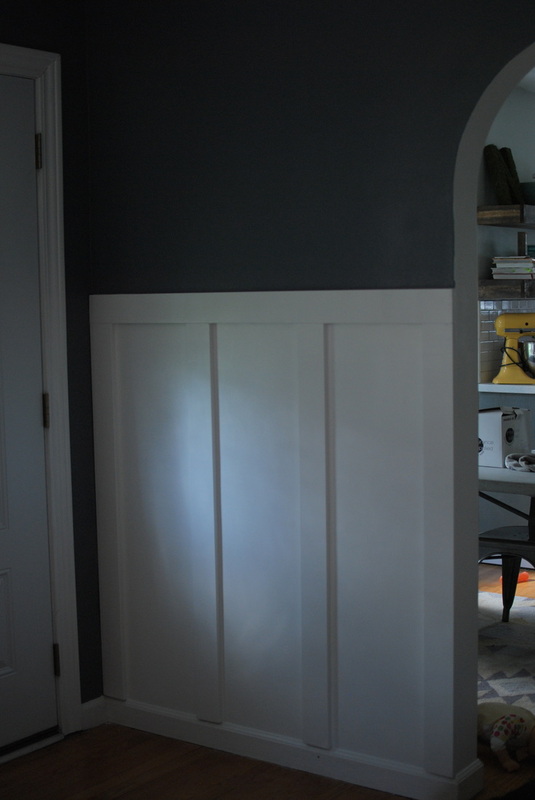 I plan on doing faux-shiplap on the bottom half of the walls with either wallpaper or stenciled walls above. I want to do some nice light wood open shelving above the toilet and some bamboo blinds for the window to replace the vinyl ones currently in there. I've gone back and forth on the flooring choice, but since I want to go bold with my vanity color and the pattern on the top of the walls, I decided a simple white matte hex tile with dark grout would be the perfect choice and wouldn't be too busy. We also will be taking down our medicine cabinet and replacing it with a mirror. Luckily we have a large linen closet right in the bathroom, so we don't have to worry about finding a place to store things. A little backstory on our bathroom. We only have one bathroom in our home, not even a powder room or second toilet (it’s definitely on the wish list, believe me!). When we moved in it didn’t take us much time to realize what worked and what didn't. The vanity that the previous homeowners installed, was far too large for the space. When the door was open, there was only about 12 inches between the doorknob and the front corner of the vanity. I don’t know how many times my daughter hit her head on either the doorknob or counter edge when she was running in and out of the room. It’s a nice vanity with pretty granite countertops, but we knew that we would eventually want to replace it with something a little smaller. The one that is currently in there is about 36 inches wide and I am thinking this space would be better suited with one that is only 30 inches. I’d love to get a vanity that has legs, so it doesn’t sit on the floor completely – hoping that makes the space feel a little bigger. We also would like to have one with drawers instead of doors, and I am loving the ones with a small shelf at the bottom for extra towels, toilet paper, etc. I plan on painting the vanity a pretty shade of blue (maybe “Rain Washed” by Behr), so the color doesn’t really matter. I would like it to have either a marble or plain white countertop, to again help make the space seem bigger and not weighted down. Right now i'm just trying to find the best one for our budget. 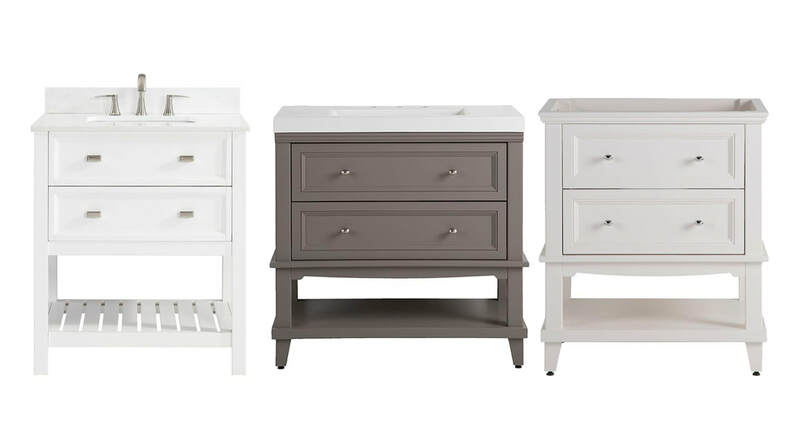 Here are some of my favorite vanities right now. ​We’ve already taken the first step in this makeover and my husband built and installed a barn door! 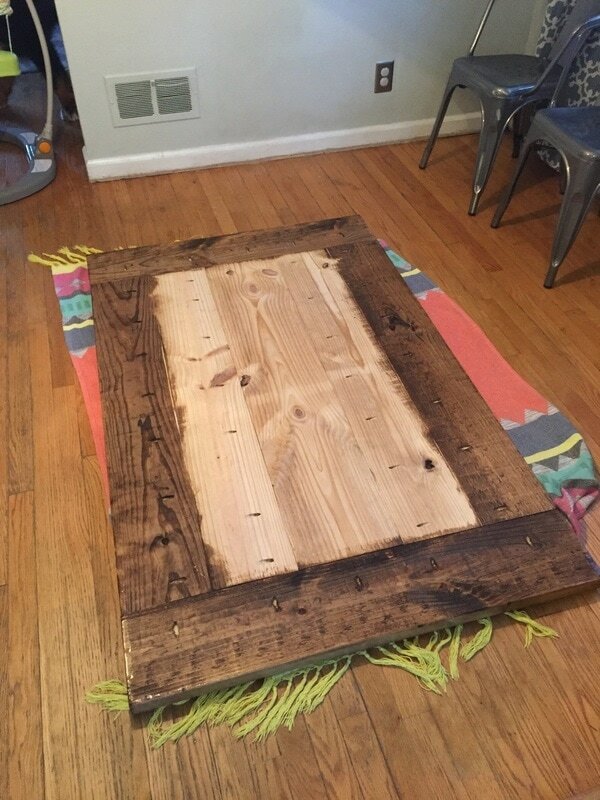 Yes, he actually built the door himself! I am so proud of him, and just this small change has already changed the function of our small bathroom. Yay for no more kids bonking their heads on the doorknob! Surprisingly the kids haven't been too rough with it (I was afraid they would push the door too hard and it would come off the tracks), and Lola actually loves being able to open and close it on her own when she has to use the potty. 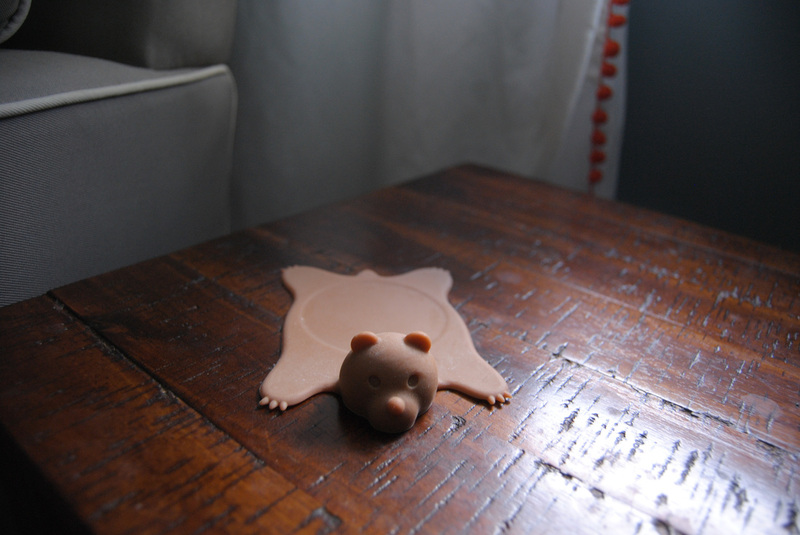 That's another plus, no more silly kid proof doorknob protectors! For those who are wondering, we do have a lock and handle on the inside of the door. I'll make sure to include a picture of the backside when I do the reveal. 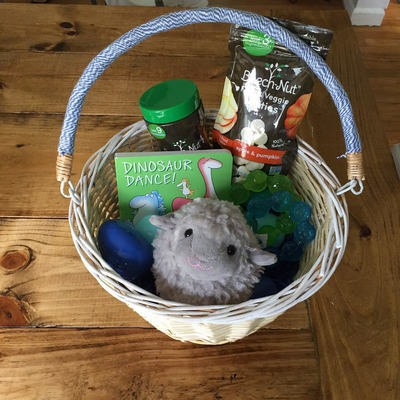 What's in my Easter Baskets? I've got some time to kill (didn't think i'd be saying that for another few years lol), so I thought we could play a game of "What's in my Easter baskets?". I finished putting them together on Monday and I cannot wait for the kids to see them. Let me start with a disclaimer by saying that I live for putting things like this together. Gift giving is for sure one of my Love Languages. 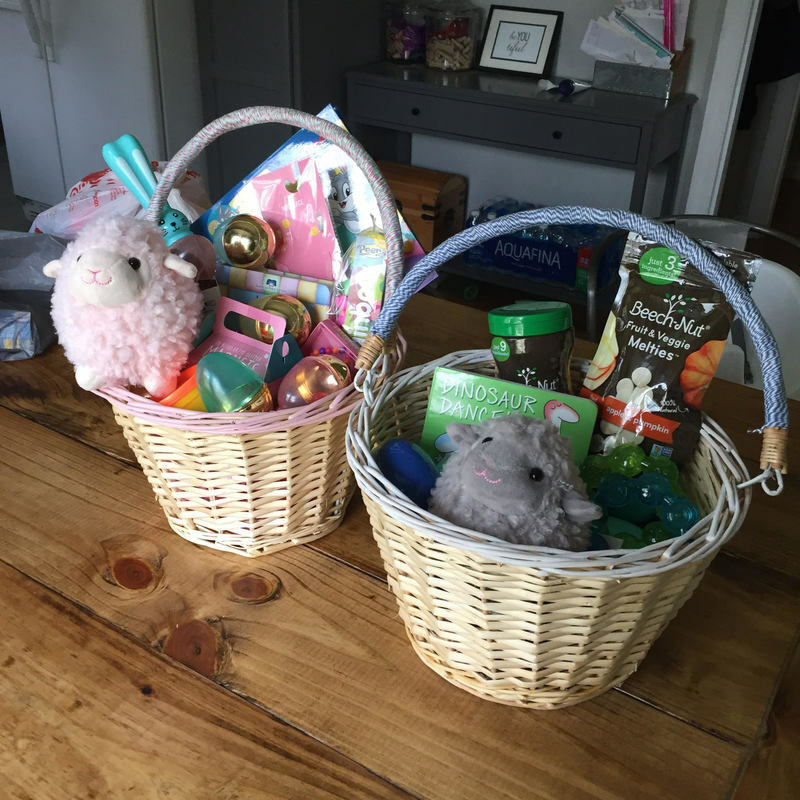 With that being said, here are the finished baskets, i'll break down how I decorated them and what's all in them further down. 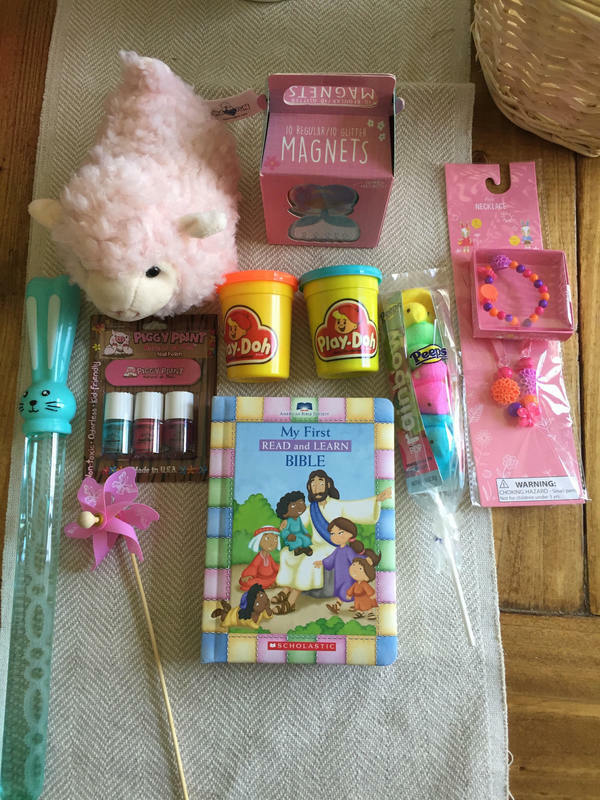 Other than a few things, everything I got came from the One Spot at Target, the dollar store, or we already had it. Easter baskets don;t have to be expensive, if you're still putting your baskets together make sure to check out the dollar sections at your favorite stores, you may be surprised! 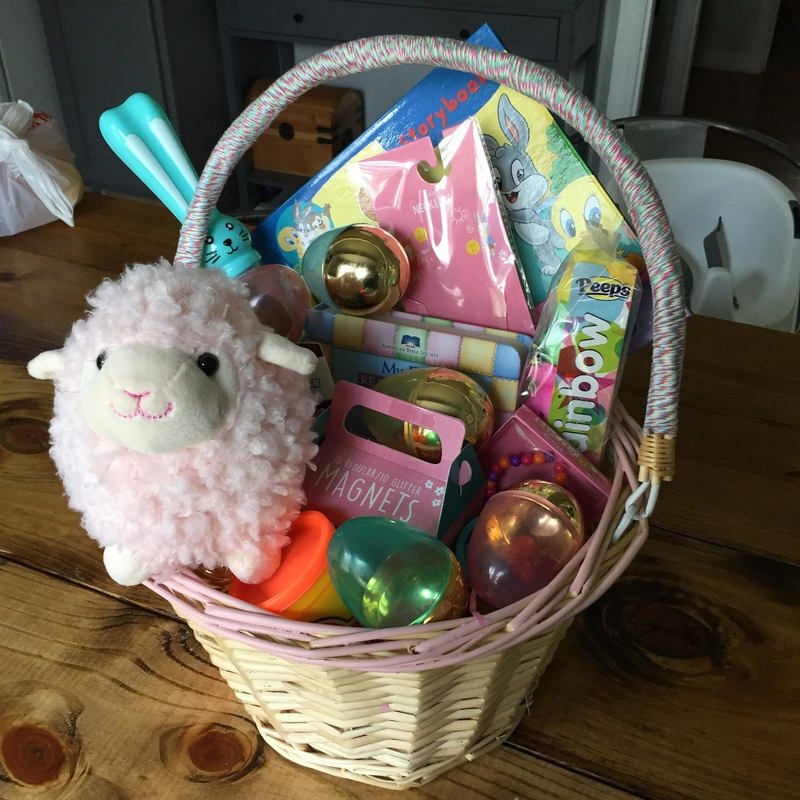 Since this was the first year that Lola would really appreciate an Easter basket, I really wanted to splurge on a cute one from Target, but they were $15 each... that would be $30 total for my kids. Even though I plan on using these baskets every year until they no longer use them (tear), I still couldn't justify spending that much. I decided that I could make cute baskets myself. I started with two of these plain wicker baskets, which were much more reasonable at $6.00 a piece. I found some blue and white, and rainbow twine on clearance at Target (#ihearttarget), and decided to wrap the handles with it. The rainbow for our sweet girl and the blue for our little man. About halfway through the wrapping process I started questioning why I did this to myself! It probably took a good 10 minutes to do each basket, but it felt much longer ha! After that was done I went into my paint samples stash (everyone has one of these right?) and found some pink paint leftover from our big girl room makeover and grabbed some white paint, leftover from who knows what. I painted the top rim of Lola's basket with the pink and did little man's in white. I added 3 little pom poms to the side of Lola's basket (again these are from target's clearance rack). I'd like to add a few to his as well, but I didn't have any on hand so I just left his as is for now. I found this cute little Looney tunes book at the Dollar Tree and obviously had to get it. She also got a little sheep (but pink of coarse), some play doh, bubbles (a fan favorite in our house- even our Bernese Mountain dog gets in on the action), a play necklace and bracelet (One Spot), princess magnets (One Spot), a little windmill (Hobby Lobby), piggy polish (she puts her fingers in her mouth so I don't let her wear regular nail polish), and her first bible. As parents we love the excitement that the Easter bunny brings, but we also want to make sure she understands what Easter is really about. Jesus. There is no playbook for parenting. 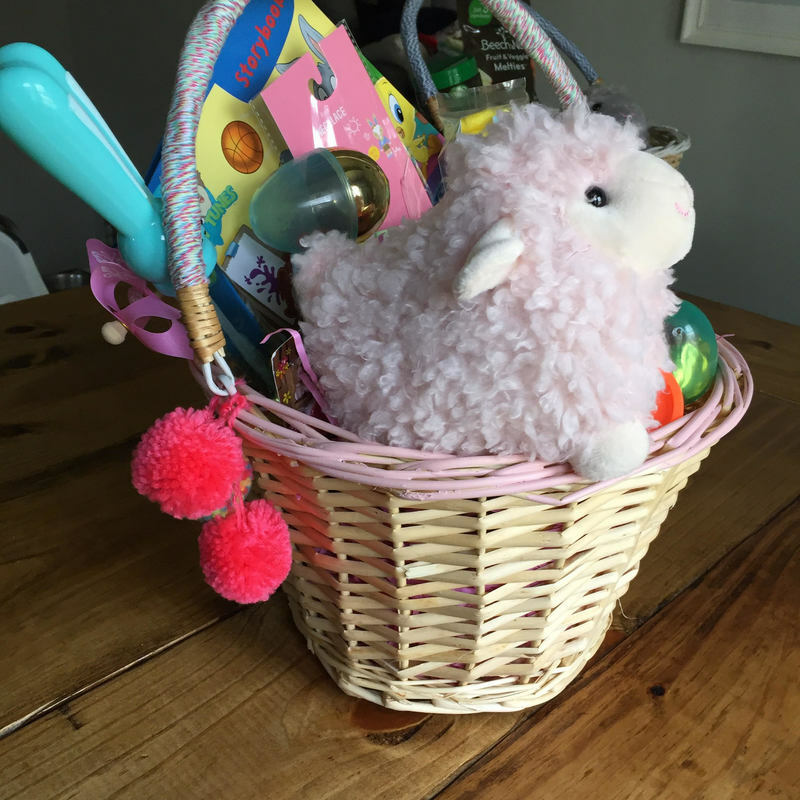 You may do something different with your kids baskets, and that's okay! We can just try our best to teach them the things that are important to us and hope that they grow up to be good people. 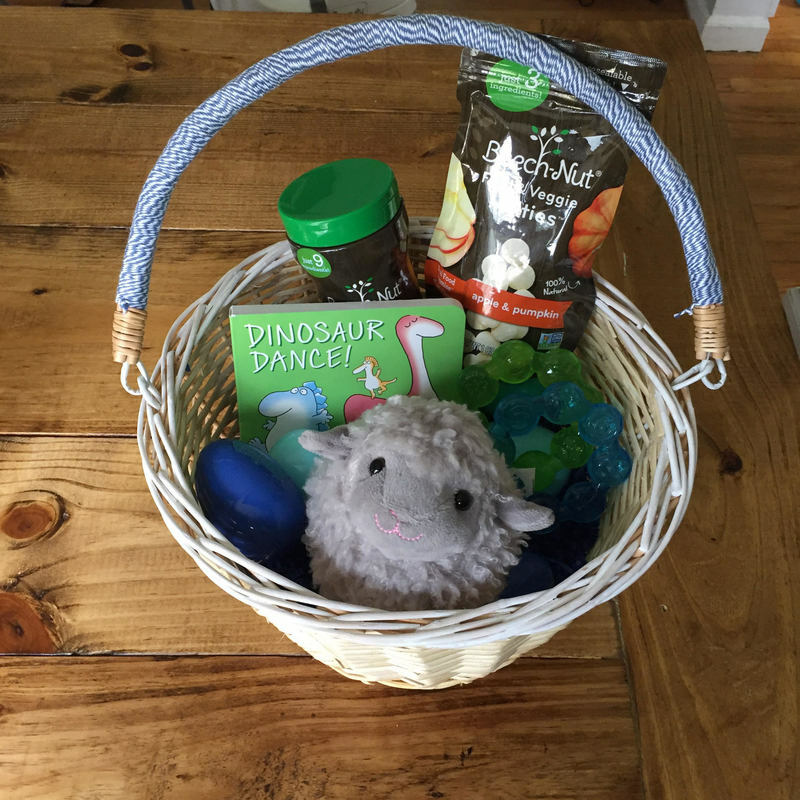 ​So there you have it, that's "What's in my Easter baskets". Easter is still a few days away so i'm going to go practice hiding and finding eggs with my little lady on this gorgeous day. 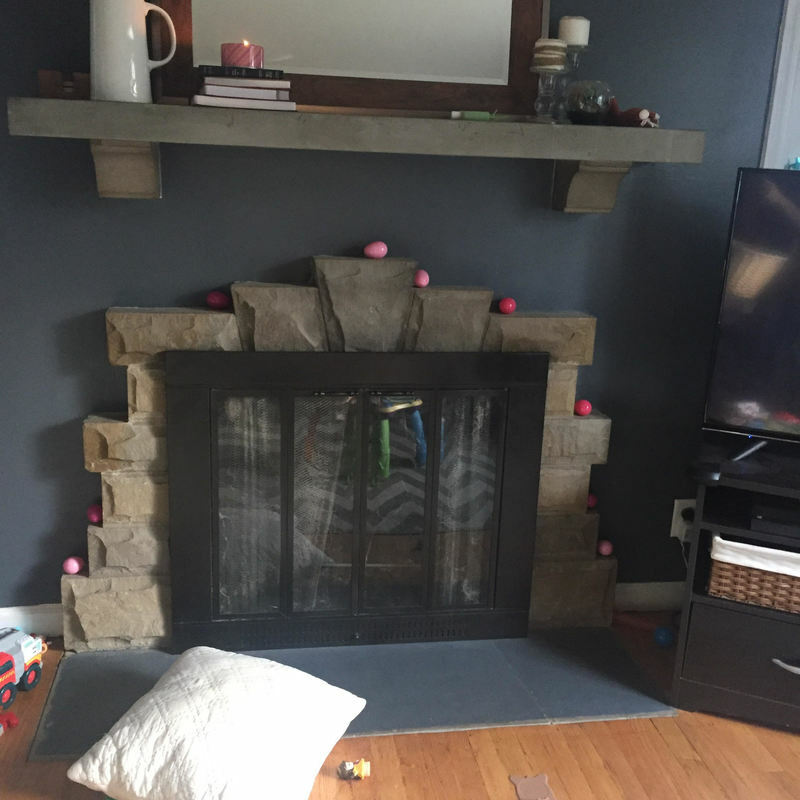 For a little comic relief i'll leave you with this picture of the eggs that Lola "hid" for me to find. She's the cutest. Happy Easter! Another chair broke (we were down to two), and we were getting ready to host a bunch of family and friends in our home for our baby girls first birthday party. So we took the round table out to the garage and brought in one of those 6ft card/party tables. 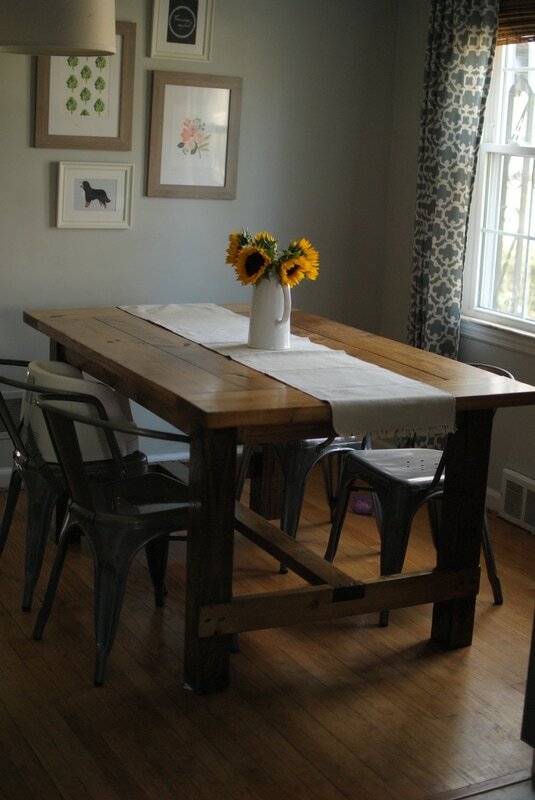 Little did we know that table would stay in use as our dining room table for the next year and a half!! 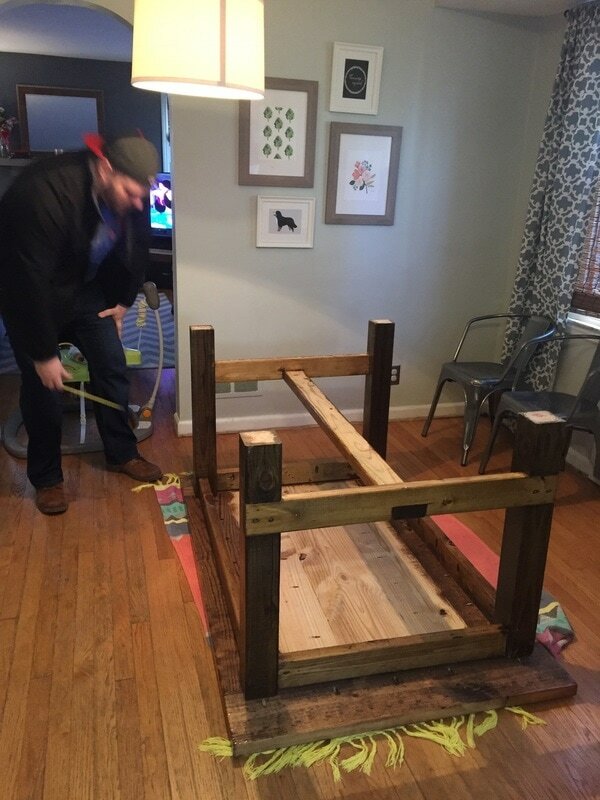 We certainly didn't plan on using that table for as long as we did, but we knew that we wanted to build our own farmhouse style wooden table and for that we needed the right tools and time, something as parents of a toddler and soon to be baby boy that was hard to come by. 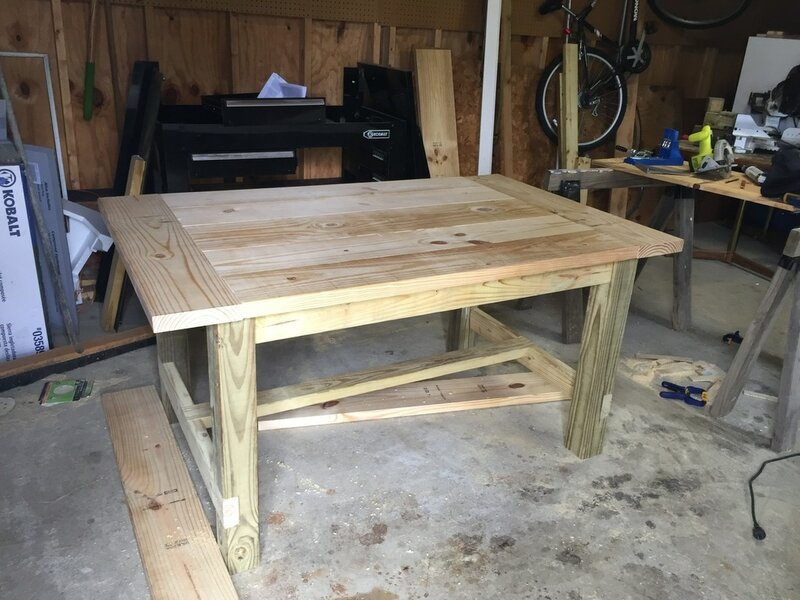 Long story short, we got the tools, found some time and finally have a new table!!!! ​My husband followed these plans from Anawhite.com and revised them to make the table a little smaller so it would fit our space better. 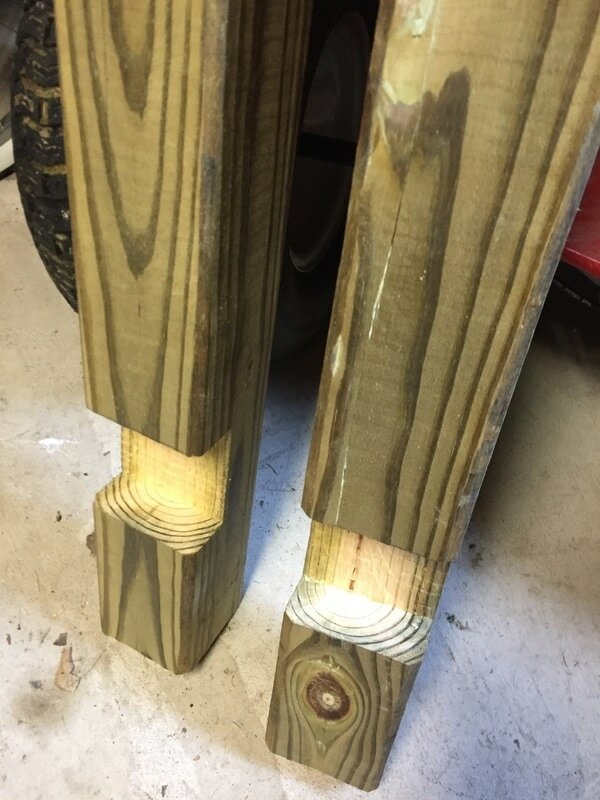 He started by building the legs and frame. 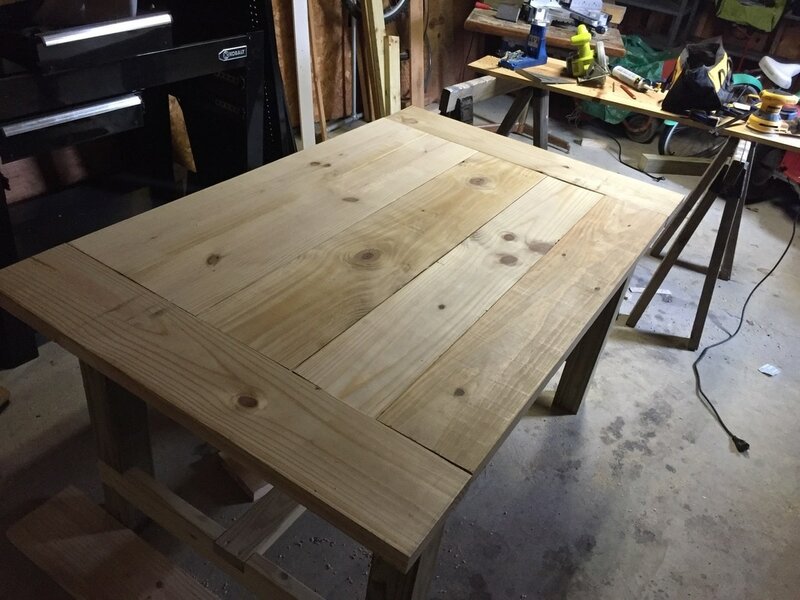 Once he finished the building portion, he sanded the table really good then he pulled a Chip Gaines and handed me the baton to stain and seal it. I started with a pre-stain wood conditioner and I cant tell you enough how important this step is to getting a nice, even coat of stain! 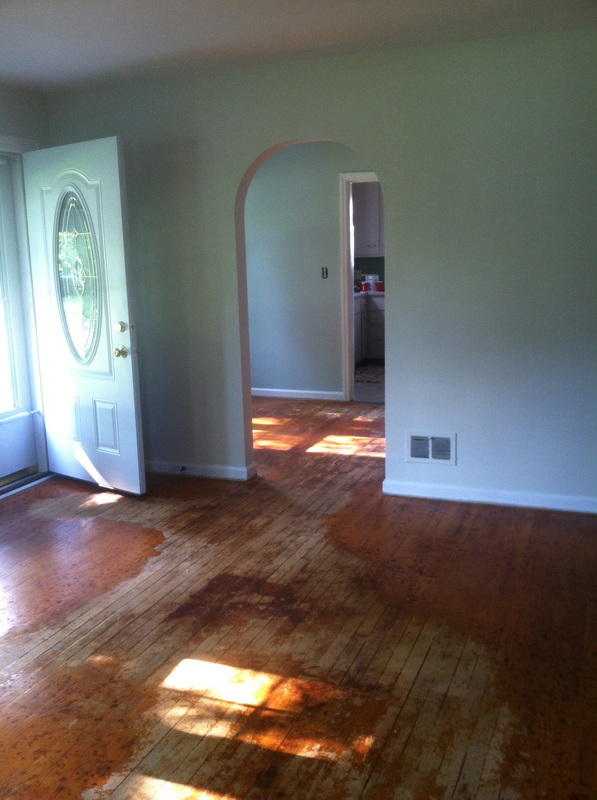 You just brush it on and wait at least 15 minutes before starting your staining. 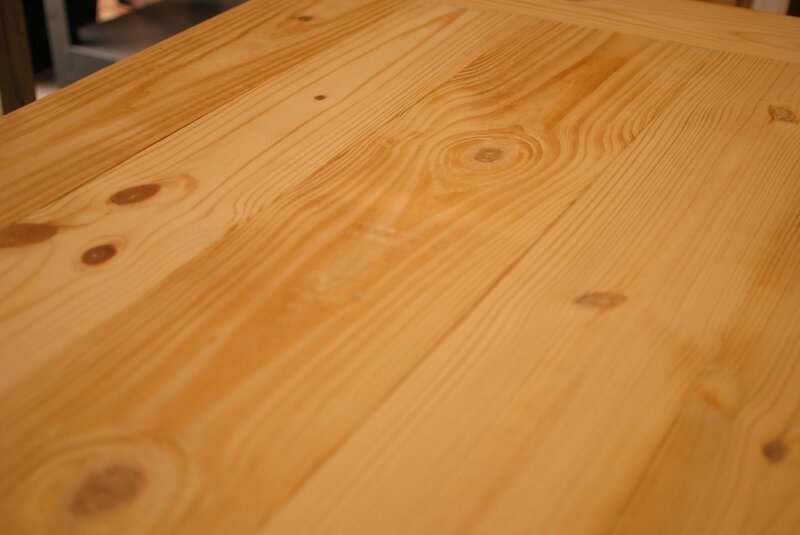 For the color I used Minwax's "Provincial" and followed it up with 3, yes 3!, coats of satin polyurethane, sanding the table lightly in between coats. 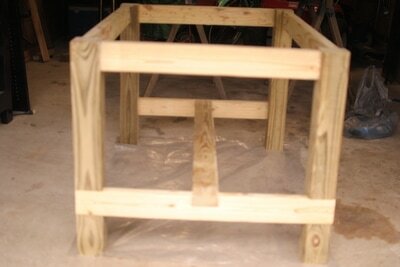 We had to let it dry for 72 hours before bringing it in the house and attaching the top to the base. It was a very long 3 days! We both kept going out to the garage to look at it and check on the dryness, hoping we could bring it inside. 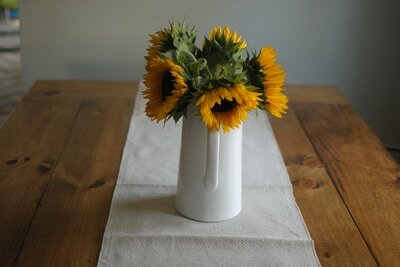 ​Add a few sunflowers and "ta-da!". Heres a side by side of the space before and after. ​This project was so much fun! Now who wants a table built so we can do it again? It's been a while. A lot has happened since I last posted back in September (go figure). Our sweet girl celebrated her second birthday, little man is growing so fast and doing new things daily, all except for sleeping at night (sigh), and that ugly Postpartum has been trying to make a comeback. How can it be that my baby girl is two years old already?! I know it's cliche to say, and those of you who aren't parents will probably roll your eyes, but time really does fly by when you have children. Something about seeing everything new through your baby's eyes makes your heart explode and at the same time make you wish you could slow things down and savour every moment so you will never forget their precious firsts, and seconds and even thirds. 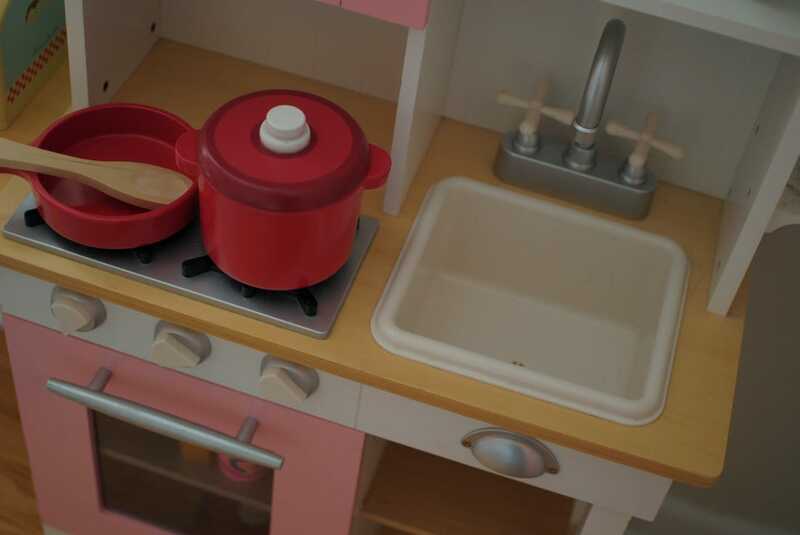 We woke our baby, scratch that, big girl, up the morning of her birthday and surprised her with this adorable wooden play kitchen that we got at a garagle sale over the summer. Do you know how hard it was to have it in the house and not give it to her?! She absolutely loves it and it just happens to match her room perfectly! 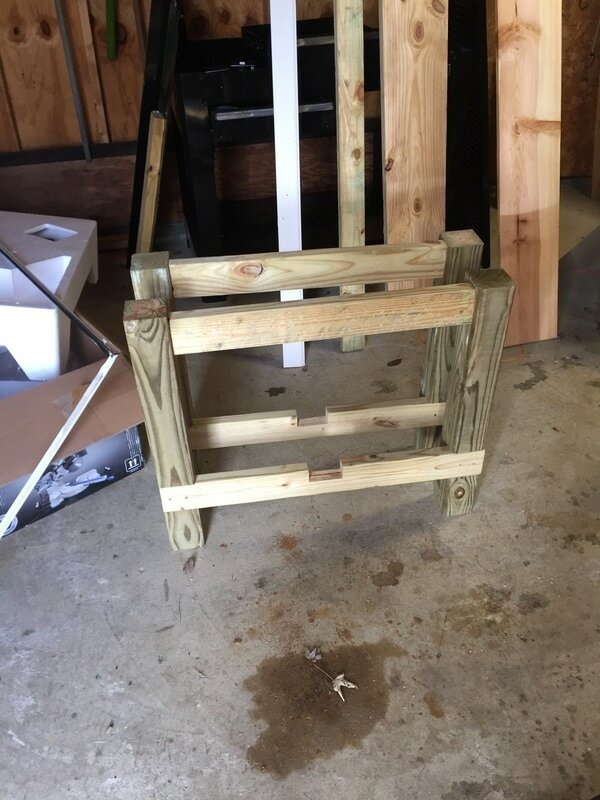 It was a fraction of the cost of the ones I had been looking at online, so when a friend told me she saw it at a garage sale I had my husband fly over there and pick it up! Her favorite thing to make us is "soup", and we love it. ​Last year I went all out throwing her a first birthday party at our house, where I made all the food, hung decorations and (of coarse) designed my own invitations. I love hosting parties, dont get me wrong, but this year I decided to do things a little differently. 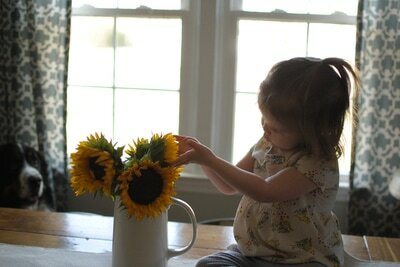 Having two babies has taught me that if I want to be less stressed out and in turn, be much happier, I need to do less. So this year I opted out of having a party at our home (can I get a "woot woot" for not needing to clean the entire house!) 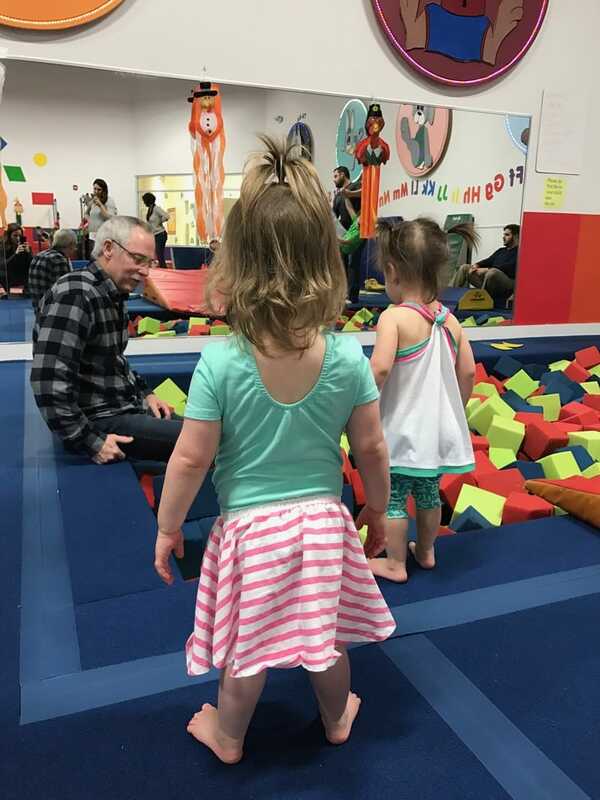 and booked a tumbling party at a local gymnastics center. I did make the invitations since that's what I do, but I decided to just make a few deserts and leave the decorating up to the venue. 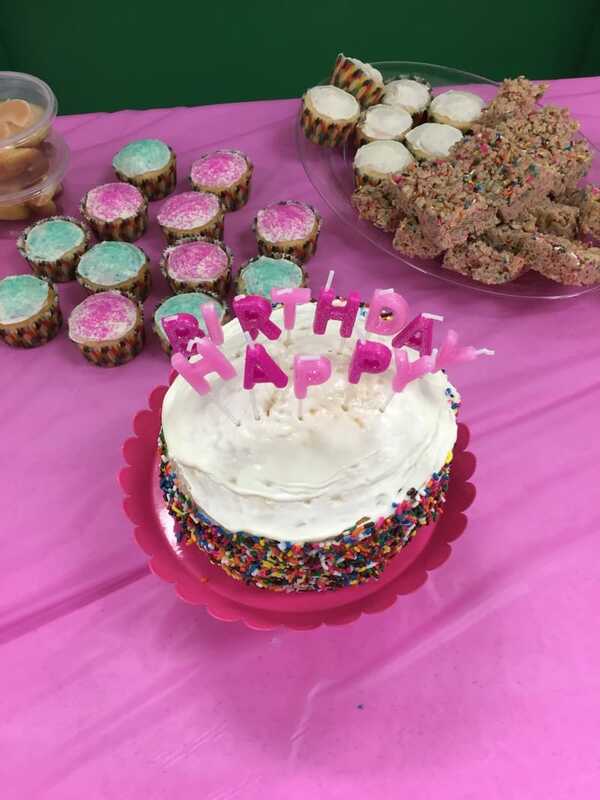 It may not have been Pinterest worthy, but the kids had an absolute blast and I was able to enjoy the party without being stressed out. 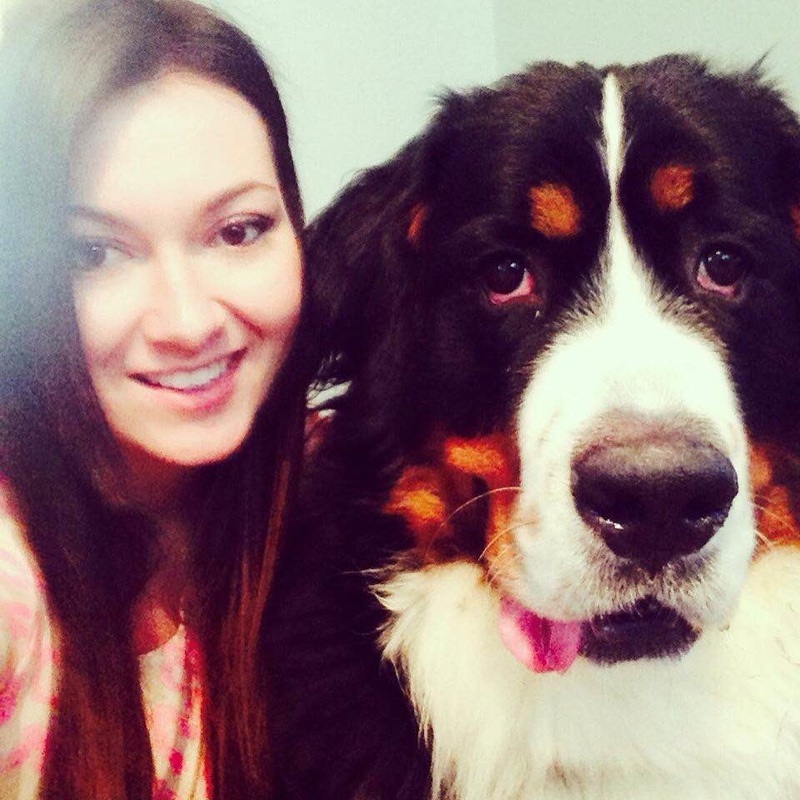 Those are the things my sweet girl will remember after all. I just lover her little leotard! On to a less cheery note... It's funny how different my babies have been from one another. My daughter was the easiest baby. She loved to cuddle and play, but would happily sit in her swing or bouncer while I did whatever I needed to do, all without a fuss. This little guy is also very cuddly and is generally a very happy baby but when it comes to setting him down or sleeping, he's terrible at it. I dont know why, but he wont sleep for very long periods at night time and usually wakes up 2-4 times. If you have ever gone 4+ months without sleeping longer than 4 hours at a time you probably feel my pain. Not getting restful sleep makes me irritable and unpleasant and I can just feel that nasty postpartum knocking at my door. My husband has been so helpful in getting me to try new things to get the baby to sleep at night, all while being super supportive of my ever evolving emotions and frustrations. I really can't tell you how blessed I am to have him as a husband and father to my babies. His support is really what has gotten me through those rough days of running on 4 hours of sleep. I do know that all babies are different and that he will eventually sleep through the night. But right now, it is hard. It is hard to wake up each morning after not sleeping much and give being a mom my all. It is hard to keep up with the chores of the house and make dinner when all I want to do is take a shower or go to sleep. It is hard to try and potty train my 2 year old while holding a baby that wont let me put him down. It is hard. The easy thing to do is be negative, and believe me, I have my days where I can only see gloom through my tired eyes. But my husband said something to me the other day that has me wanting to do better, wanting to be better. As I was in a negative state complaing about how cluttered the living room was with all the toys and playmats and bouncers, he said to me, "one day these things wont be here and we will have kids, not babies, and you will want these things back". It's true. I get so caught up in how i'm feeling and letting anxiety and stress take over, that i'm really just taking away those sweet moments and memories with my babies. I know it's not the new year quite yet, but my new years resolution is to be present and truly savour every moment I have with my family. I dont want to look back and have regrets about this chapter in our lives. Hopefully in a few months I will be reporting that my sweet boy is sleeping through the night and instead of talking about my lack of sleep I'll be sad that he has moved to his own bed and isnt needing me as much, but for now I'm going to take a note from my daughter and try to find the wonder in the little things each day. 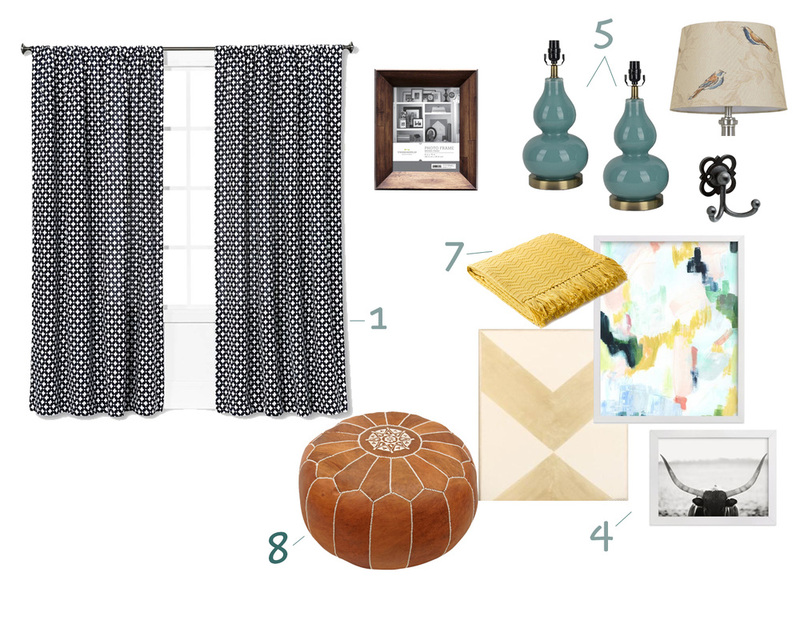 ​Now that the board and batten is finished in our living room, I cant stop dreaming about the way I want to style the rest of the room. It probably doesn't help that since i'm still on maternity leave, I currently spend 80% of my day in the living room, leaving lots of time to let my mind drift. Since I don't have the luxury of doing everything all at once (time, money, energy etc.) 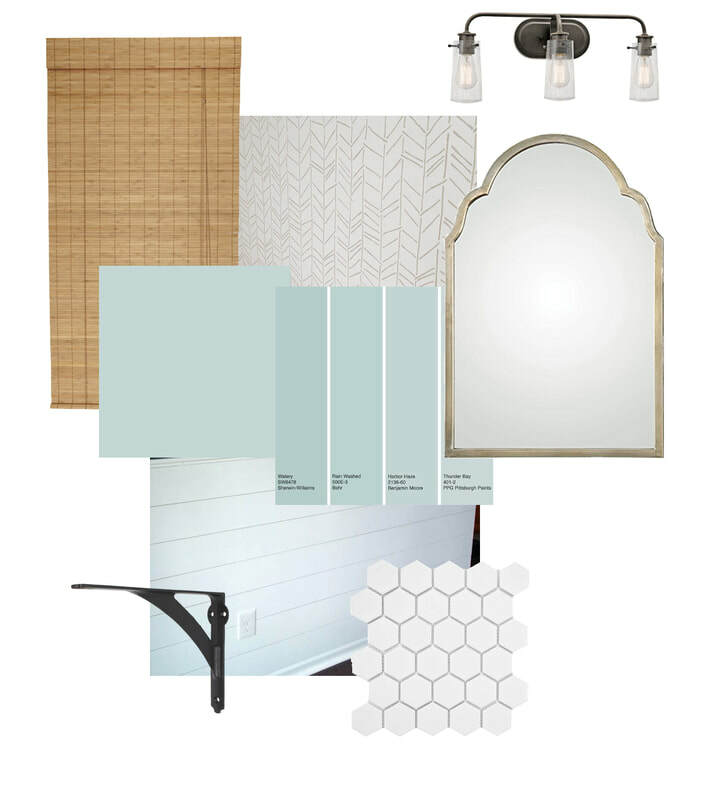 I thought it would be fun to put together all of my ideas for the space on a mood board while I wait. Though Pinterest is a good way of doing this, a mood board allows you to see everything grouped together in a way that Pinterest doesn't. Since we have lived in this space for a few years now, and almost two of those with a baby (now toddler! ), I have a pretty good idea of what we need, and what I want to make this space function at it's maximum potential all while feeling comfortable and welcoming. Our house is small so this space is the most lived in out of the whole house. 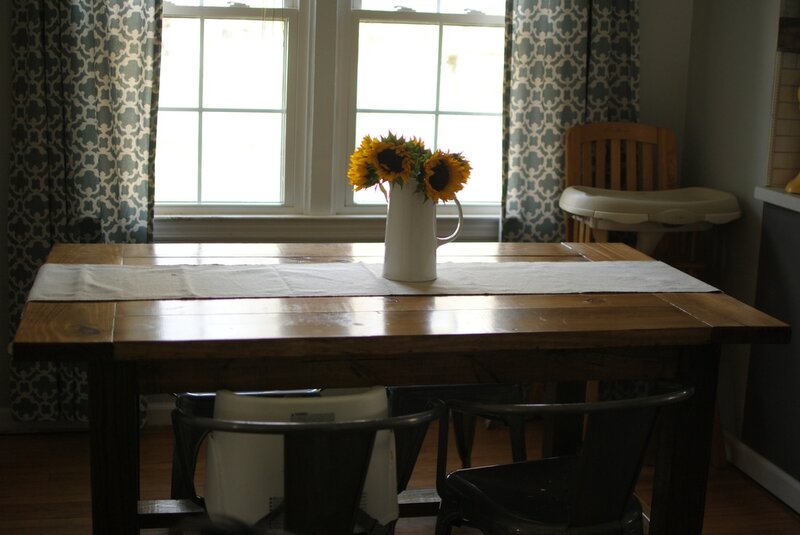 In addition to it being the main gathering place, it also works as a play room for our daughter. 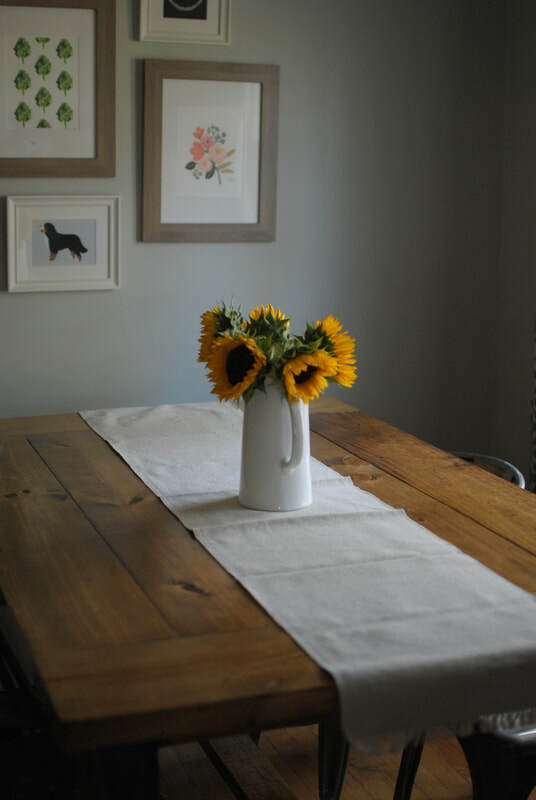 All things to take into account when finding pieces for this space. 1. New, light blocking curtains. We currently have some of IKEA's VIVAN curtains hanging over bamboo blinds. Neither of the two do a good job at blocking out light, so at nighttime it's easy to see into our home, even when they are both closed. 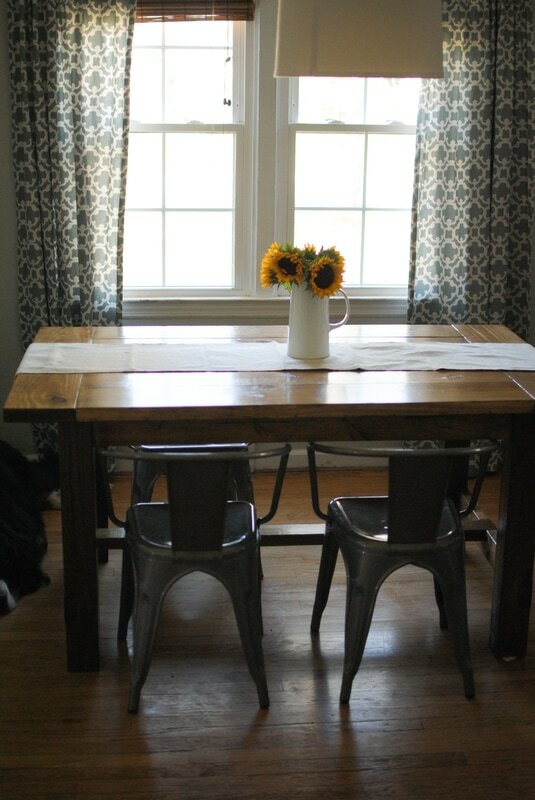 I love the look of these curtains from Target and the Navy option would be perfect for our space. 2. Some type of secondary seating. We currently have a very large, brown, rocker/recliner in the room. It was a piece that was given to us when we first moved in, and while it has certainly served its purpose, it's seen better days. And to be honest, it just doesn't fit in the space anymore both physically and aesthetically. I want something that isn't so small that would be uncomfortable to sit in but it still needs to fit in the space better than the chair that is currently there, the fabric should be durable - either washable or some type of faux leather and it needs to be affordable. I've looked online, but this might be one item I need to see in person first. 4. Art for the walls. 5. 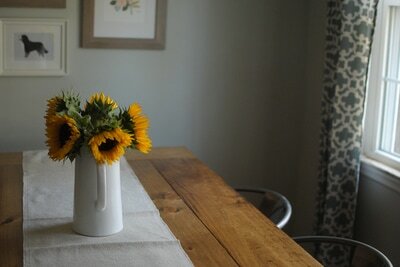 Lamps for the console table. 6. New, neutral throw pillows. 7. A few new throw blankets with a pop of color, i'm thinking yellow. 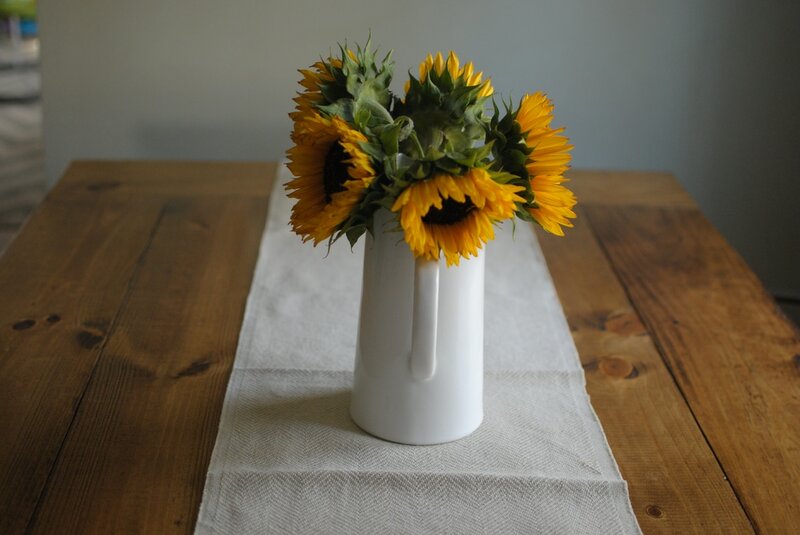 I really like the look of ceramic garden stools and i'm hoping i can find a great end of season deal on one! I really love the way everything looks together. I'm sure some things will change between now and whenever I start getting the pieces for this space, but for now this is the look i'm going for. I can't wait for this room to finally feel like home :) Let me know your thoughts. 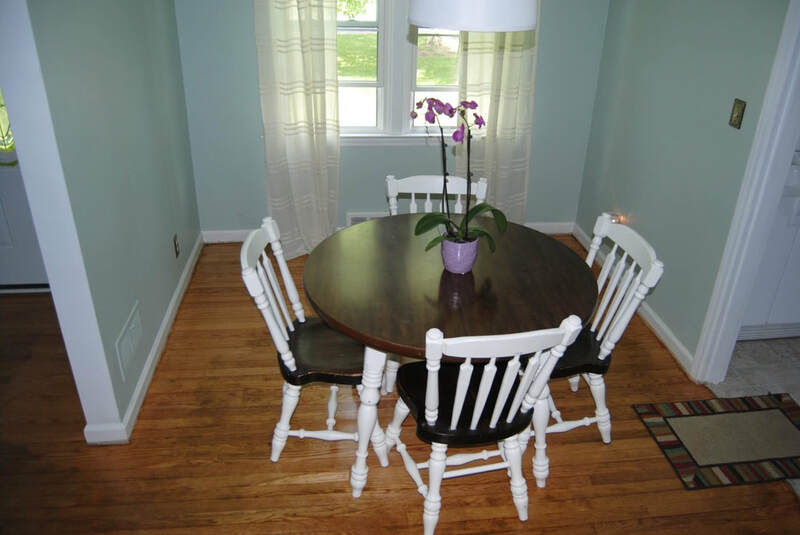 Have you seen any good accent chairs for an affordable price? It's been a busy week at our house! We had a great labor day weekend and a busy start to the week. Over the weekend, a handful of my husband's friends surprised him and came to town from all across the country for a fun and unexpected get together. Even though we don't get to see them but maybe a few times a year, we are so blessed to have such wonderful people in our lives and love every chance we get to spend with them. :) I planned on writing this post yesterday, but unfortunately I was off getting a root canal instead... lucky me! But never mind that, things are looking up, my mouth is less sore, today is Friday, football has officially started (finally!) and our living room board and batten is finished! I love the look of board and batten and knew I wanted to add it to some space in our home. The perfect space? The living room! Our living room has sort of been neglected since we moved in. It's been painted a few times and we even bought a new rug and couch recently, but other than that I have yet to hang any art or pictures and have a collection of miss-matched furniture in there that needs to eventually get updated. We have lived here for 3 years so it was time I turned my focus to this room. 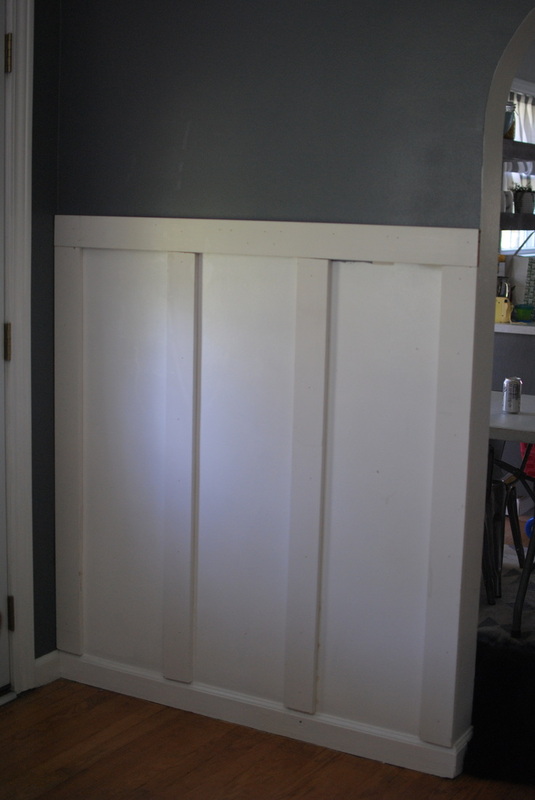 Since we don't have a proper entryway, by adding board and batten to a wall in the living room we sort of created a fake one by creating space to hang some jackets while adding some architectural detail. ​This is what the space looked like when we moved in (one before we did anything and the other after we painted and removed the carpet). The board and batten is going to go on each side of that archway. To get started I painted the living room it's new color and made sure to only paint the top portion of this wall while painting the bottom portion in a white semi-gloss to match my trim. 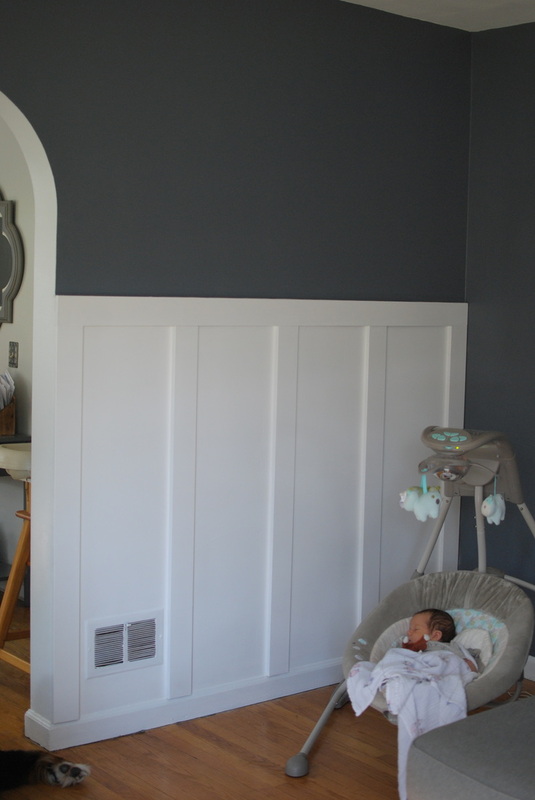 While I love a colored board and batten, I decided ours would look best white to bring a little lightness to the room since the new wall color was so dark. ​This was a two person job, well I should say one and a half (me being the half lol). My husband took all of his measurements and cut the MDF boards to size. 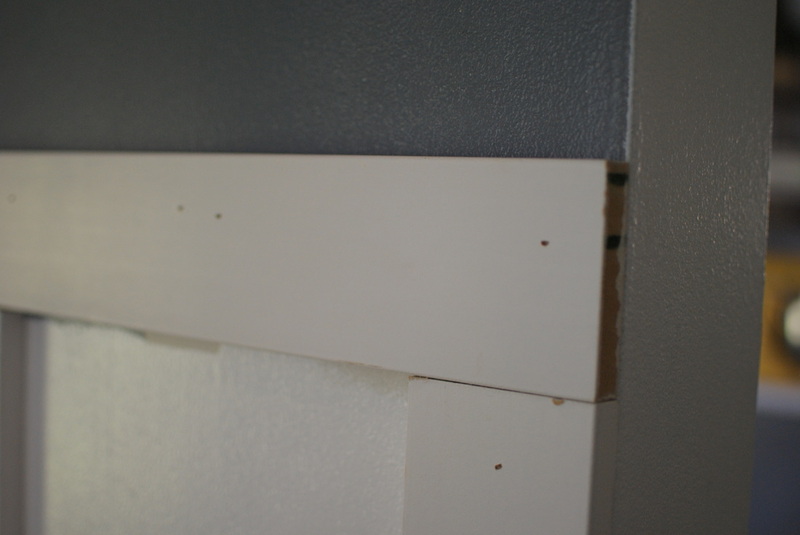 He put some liquid nails on the back of the horizontal piece for the left wall and I helped hold it on the wall while he made sure it was level and then he nailed it to the wall. 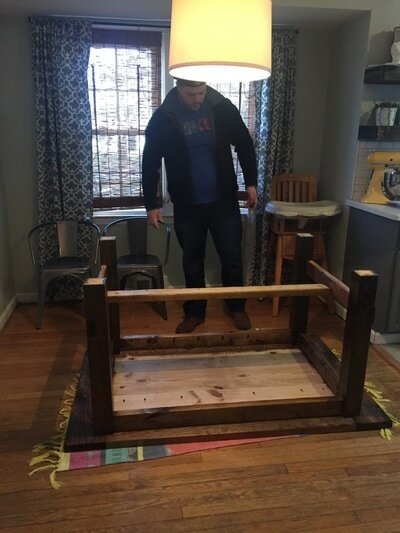 Once the top piece was up, I held the rest of the boards up so he could level and nail them in place. We spaced ours a little over 12 inches apart on this wall. The spacing for the other wall was a little over 13 inches, but looking at the walls together it would be hard to notice the difference if I hadn't told you. 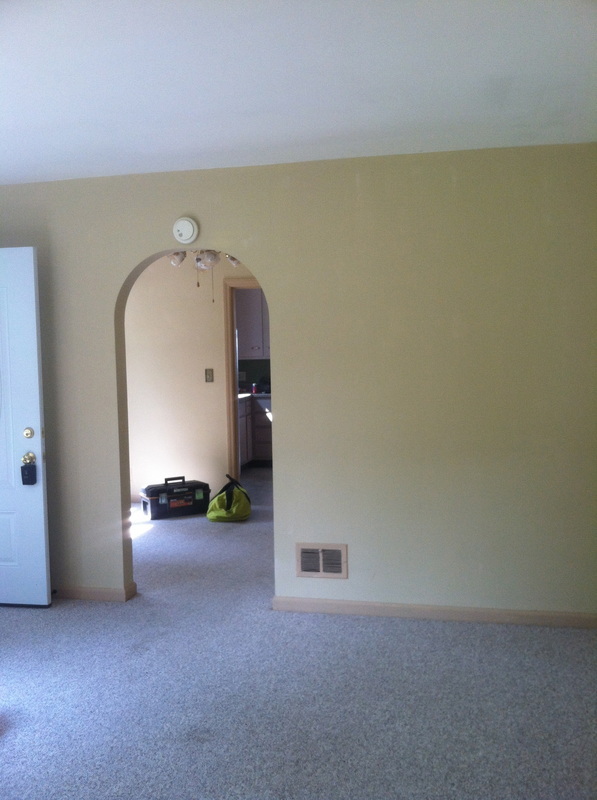 Here is a picture of the first wall with all of the boards up before we filled the nail holes, caulked and painted. What do you think?! I just love the way they turned out :) I can't wait to get some pictures hung and post one good before and after shot of the space! 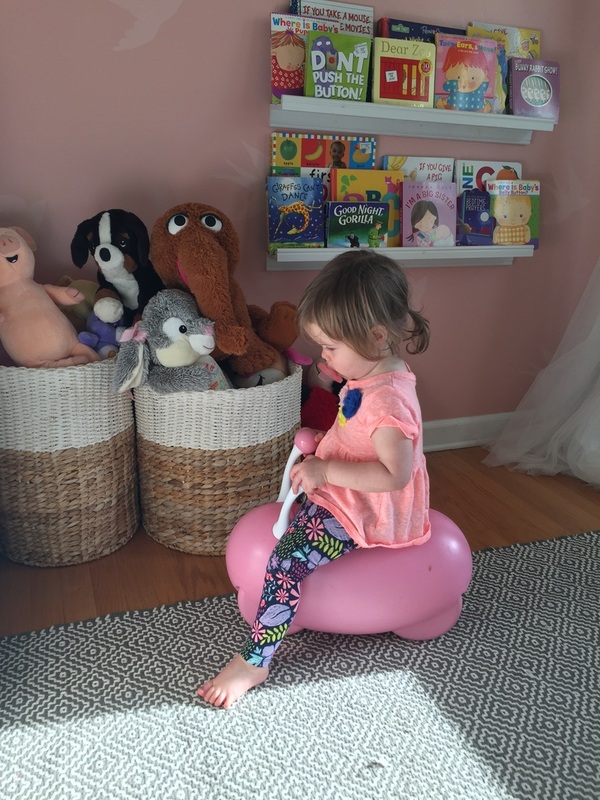 Cue the tears, our baby girl is moving into her very own big girl room! 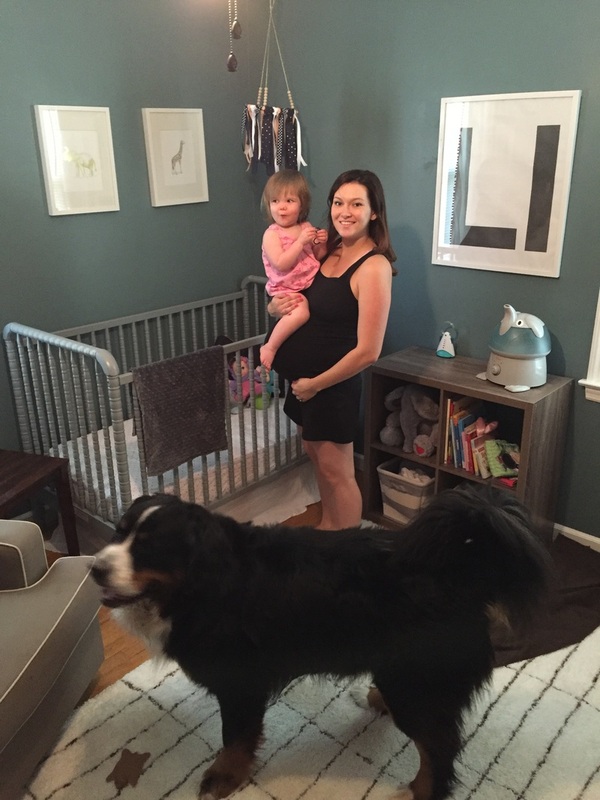 Once we found out that we were expecting baby #2 we knew that we wanted to leave the nursery where it was and move Lola into a new "Big girl room". 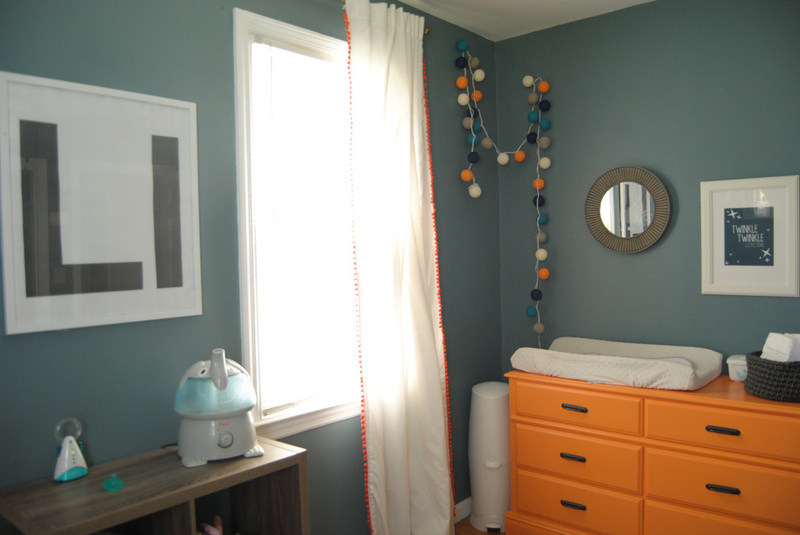 I posted quite a few months back with my design ideas for the room and i'm happy to say that 5 months and a new baby later, her room is done (well mostly)! *I had an adorable little model for this photoshoot :) I see you buddy! 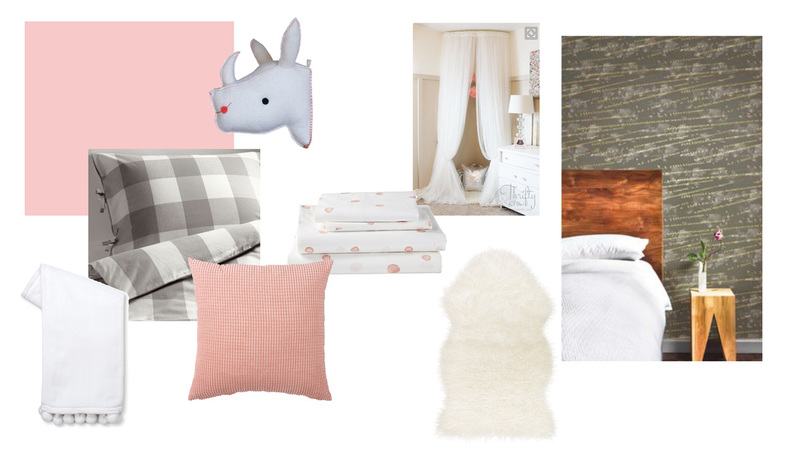 My initial inspiration for this room came from pantone's color of the year, "Rose Quartz". 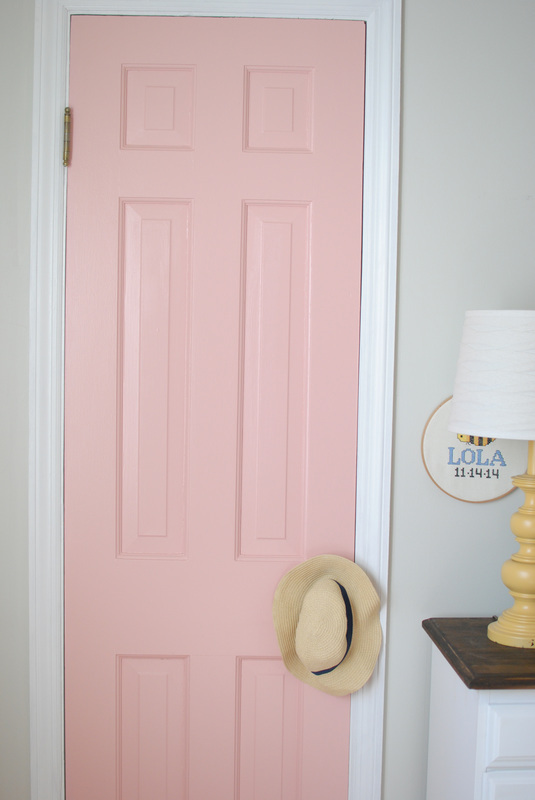 After seeing the paint swatch in person I ended up choosing a slightly different shade of pink and used it to paint the back wall and closet door in. 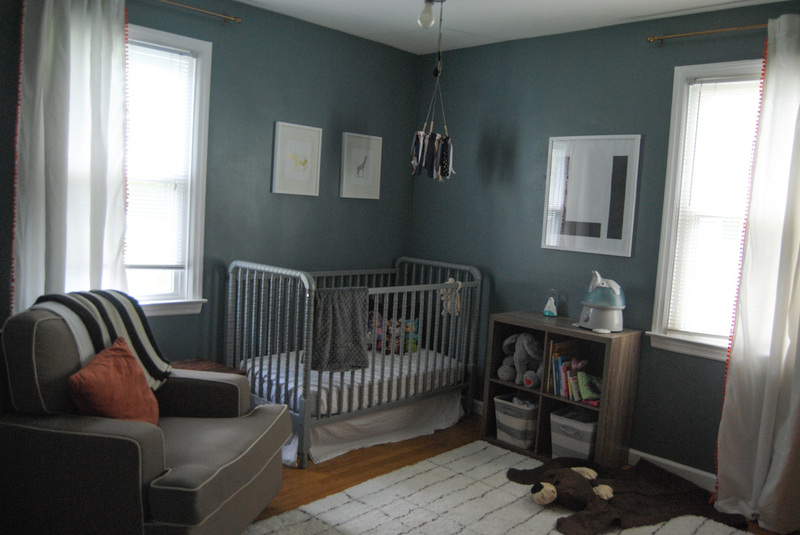 The rest of the room was already painted in Benjamin Moore's "Going to the Chapel", which is a really pretty greyish tan so I decided to keep the remaining three walls this color. I originally wanted to put up some removable wallpaper on one of the walls but couldn't commit to one design without seeing it in person. So my compromise? A stencil! 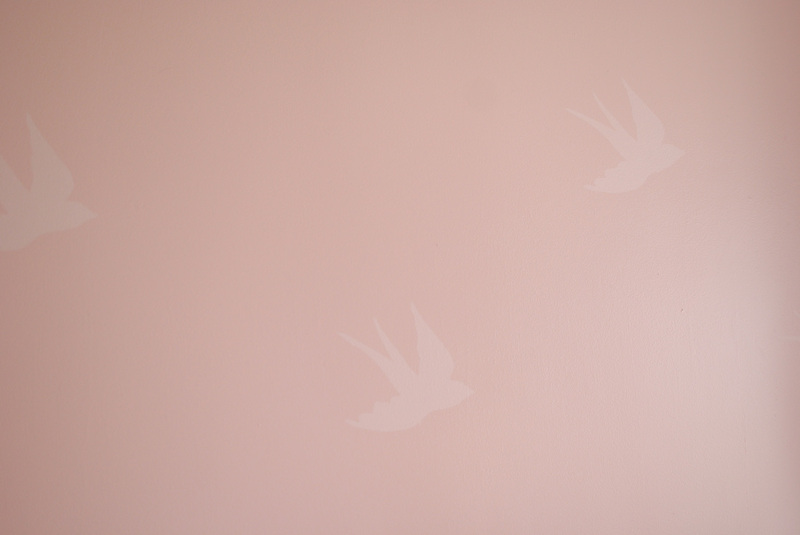 I bought some stencil paper from Hobby lobby and traced onto it a bird silhouette that I created using photoshop. I cut out the bird using an exacto blade and a few minutes later had my very own custom stencil! 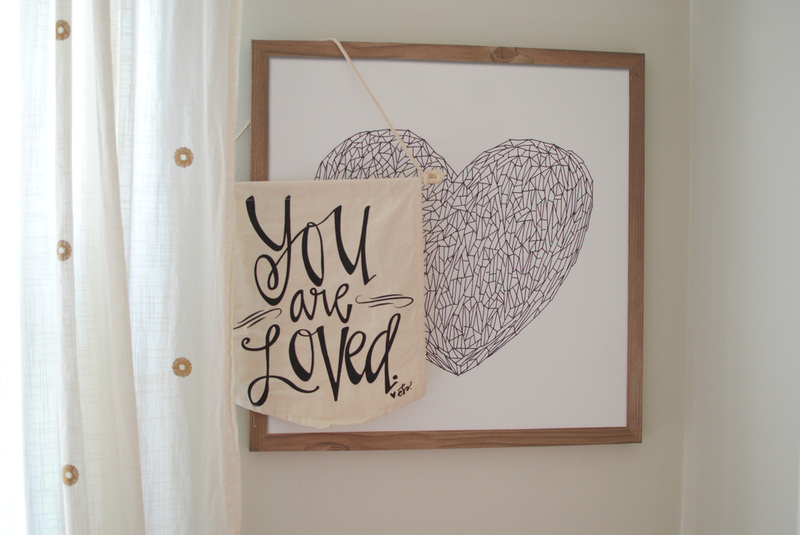 Stencils on etsy can cost up to $25. The stencil paper was only a few dollars after my 40% off coupon from hobby lobby and since I was able to creaet my own design that part didn't cost me anything. 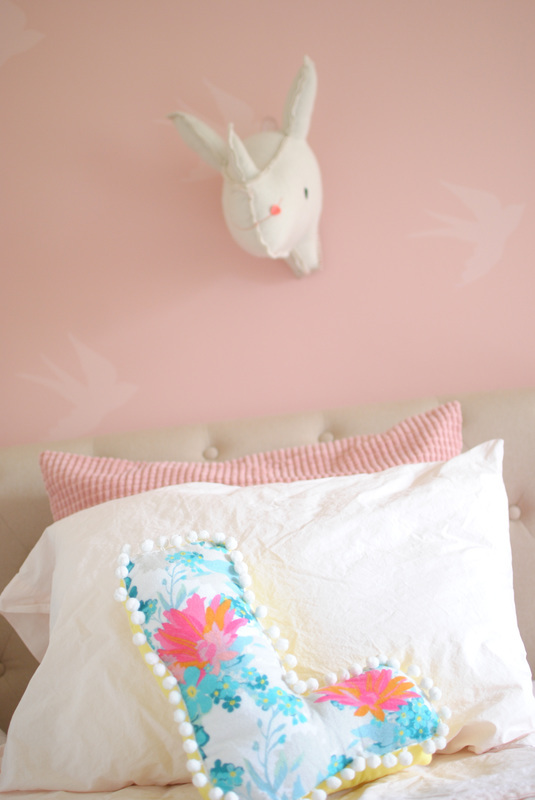 I mixed a little white paint in with the pink that the wall was painted to get a real subtle pink. This picture doesn't do them justice. The birds definitely show up more in person. I like how subtle they are. It allows me to hang up art on that wall without it competing with the stencil! 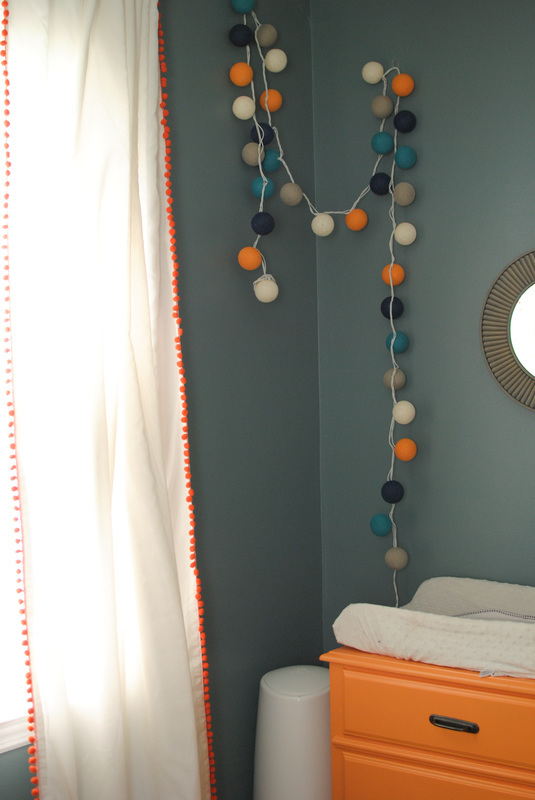 In my post with the ideas for this room I was still trying to find a twin bed that looked nice and wasn't too expensive. Well, I ended up going with the one from Target that I first posted about! I got it on sale and it came with free shipping. I couldn't love it any more :) I think it's a piece that will really grow with Lola as she gets older. 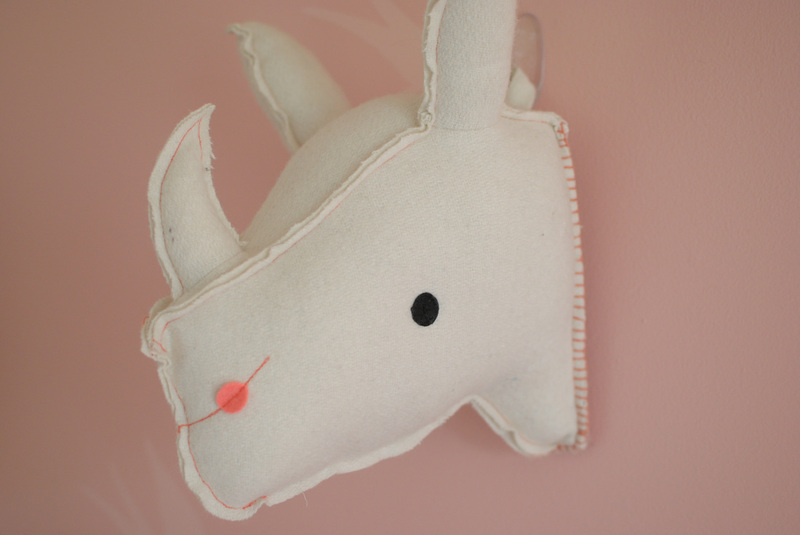 The cute Rhino head above her bed was one of the first things I got from her room. It's from the new Pillowfort collection at Target, though I don't think they carry this option any longer. Can you tell that Target is my happy place? 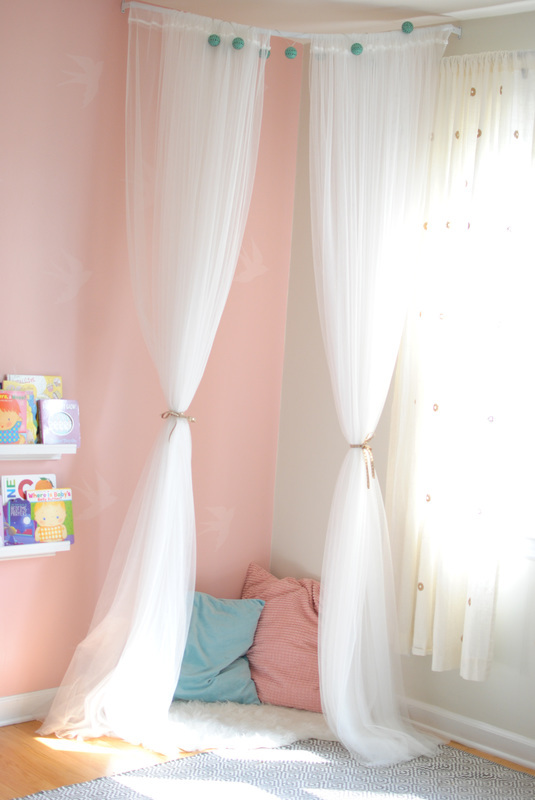 Another inportant part of Lola's room is her reading nook. This girl loves books! I bought a curved curtain rod on Amazon and had my husband install it right below the ceiling height. I used 4 panels of these curtains from IKEA and put in a few pillows and a cute faux sheepskin rug (also from IKEA) to make it extra comfy for her. To say that she Loves this corner is an understatement! She has so much fun sitting behind the curtains, reading and playing peek-a-boo! 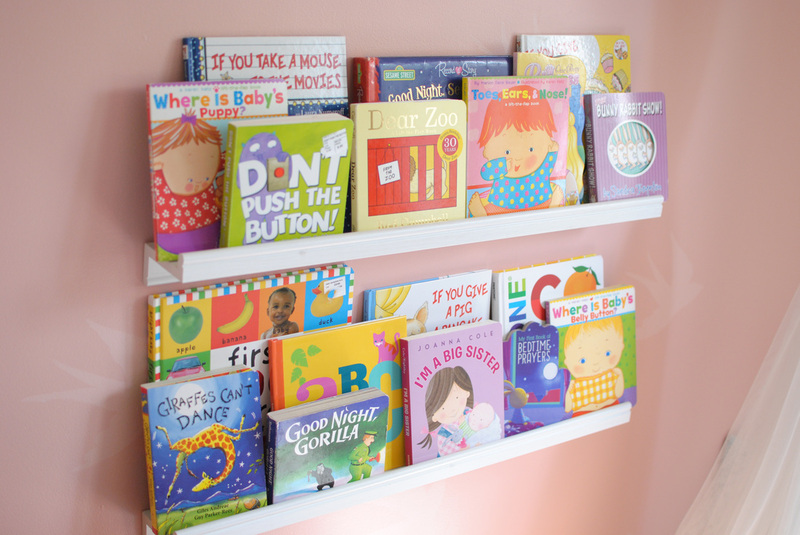 I grabbed a few of these shelves when I was at IKEA, and we hung them next to the reading nook for Lola to put her books on. I love that she can reach the books herself and can take them down or put them back (we're still working on that one) whenever she wants. 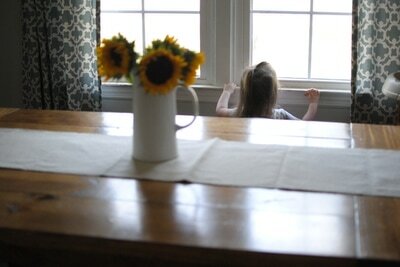 I was able to use the curtains I had in her nursery and picked up a few pieces of art for the wall with the windows. I do need to get her some new blinds. I had a major oops moment when I was trying to trim the cord length and totally cut them too short. Now the left blind only goes down half way. Sometimes I have to laugh at myself. Since we were keeping the dresser in the nursery, we had to get a new one for Lola's new room. My mom found this one at a garage sale for $50 and I knew it would be perfect. 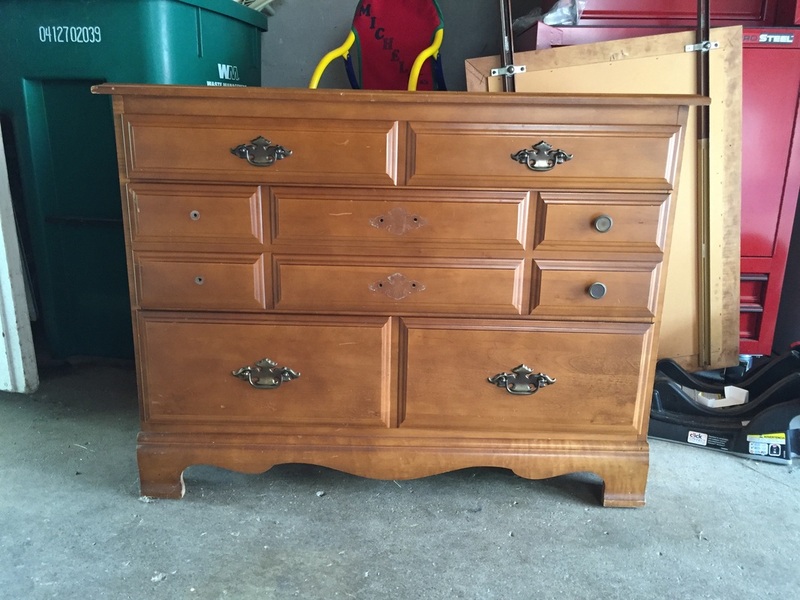 I painted the main part of the dresser in a white paint in a satin finish and had my husband stain the top in a dark walnut color. I absolutely love the way it turned out!! I do still need to get pulls for the drawers. It is a little strange and only two of the pulls are the standard 3" size. All of the others are 2.5". This has made it a little tricky to find some I like. I am so happy with the way this room turned out, but what makes me even happier is how much Lola loves her new space. 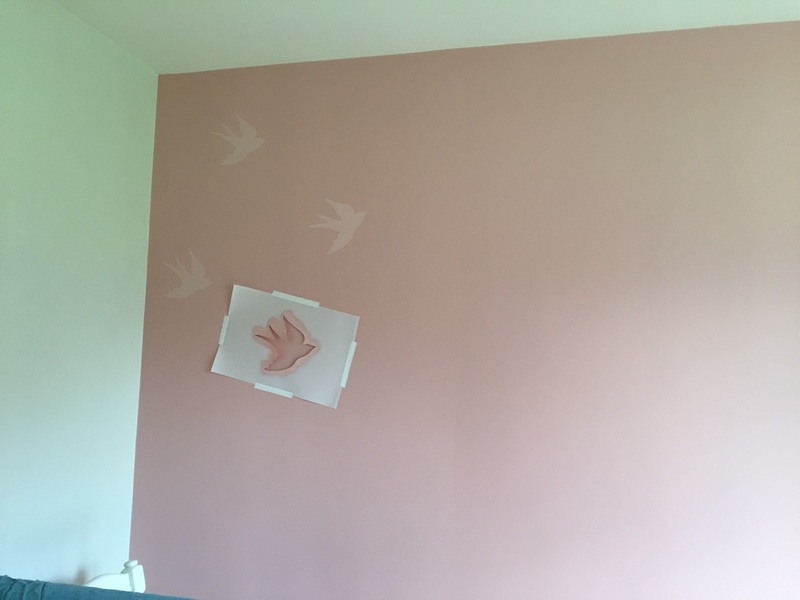 I've mentioned it before, but I had a serious creative block when it came to decorating my daughters nursery, and looking back now, I question a lot of my decisions and wish I had done things differently. 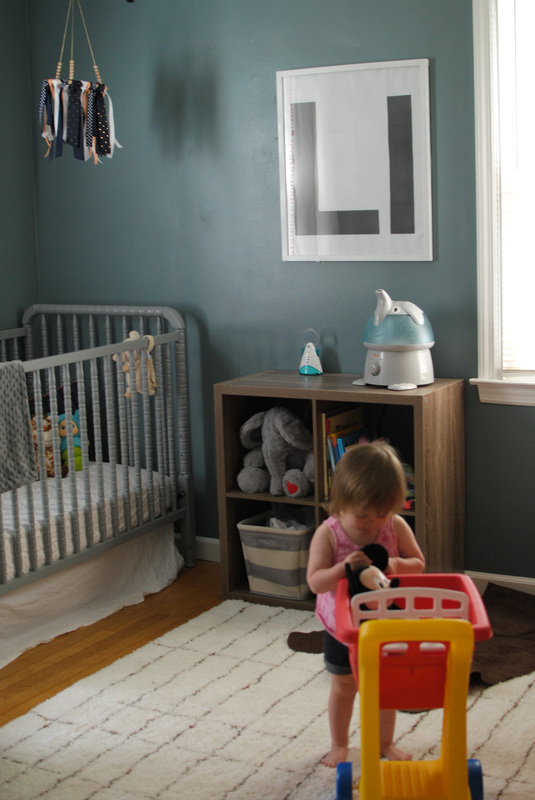 Since creating a special space for my babies is so important to me, I was determined to not let that creative block happen with this baby's room. 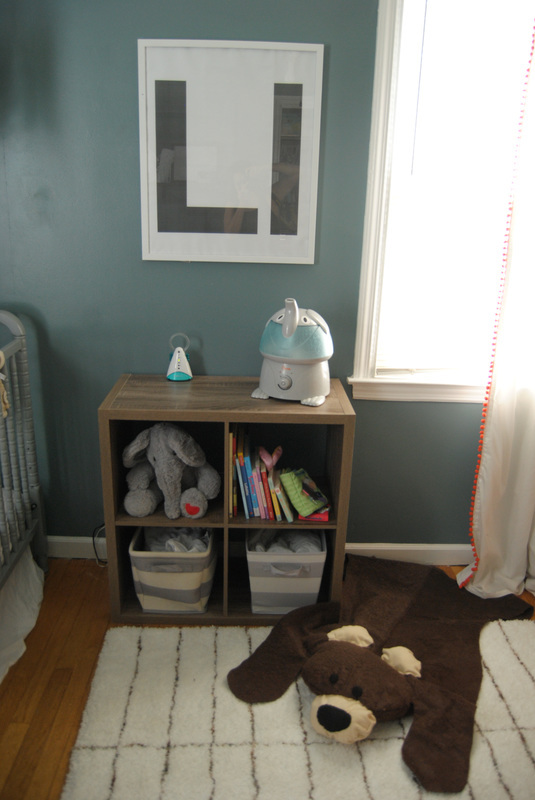 I found a lot of inspiration on Pinterest and on other bloggers sites and put together a sort of running list of things I liked for little man's room in case the indecisiveness struck again. Since Lola hasn't fully transitioned to her big girl room yet, it was a little tricky re-doing the nursery since it was still technically her room. With all of the changes about to happen I tried to be especially sensitive because I didn't want to make her feel like she was being kicked out or like she didn't have a place of her own. So around month 8 I decided I had waited long enough and I got started. I painted the walls a bluish gray. I initially wanted them to be more of a shade of teal, but since I color matched my original choice to a paint with no VOC (gotta keep that baby safe!) the color changed slightly. 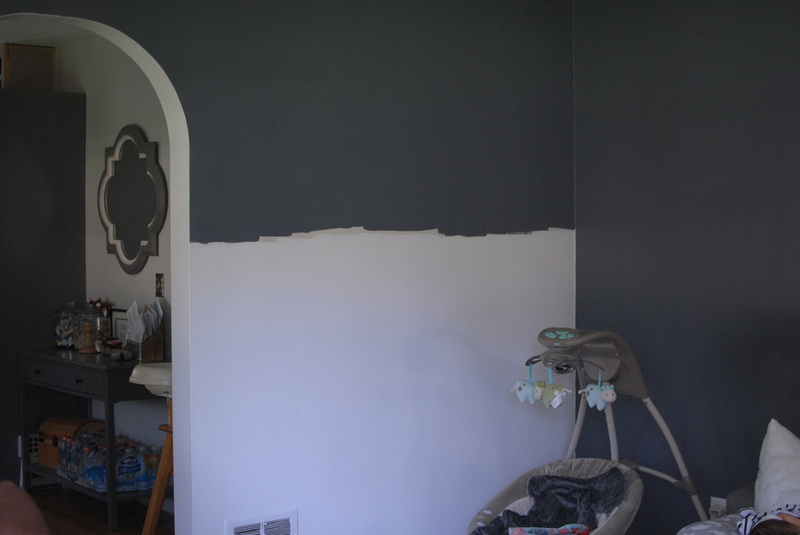 If you have ever painted a room while being 8 months pregnant, (I think my body was sore for a week after!) you can respect my decision to accept the new color and leave it alone. 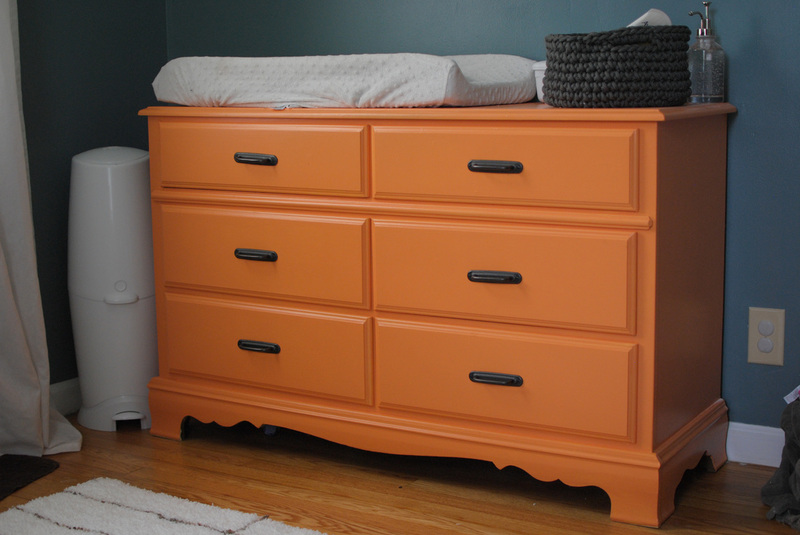 The dresser that was already in the nursery was the perfect height for a changing table, so instead of moving it to Lola's room with her, I gave it a fresh coat of (orange) paint and left everything else alone. 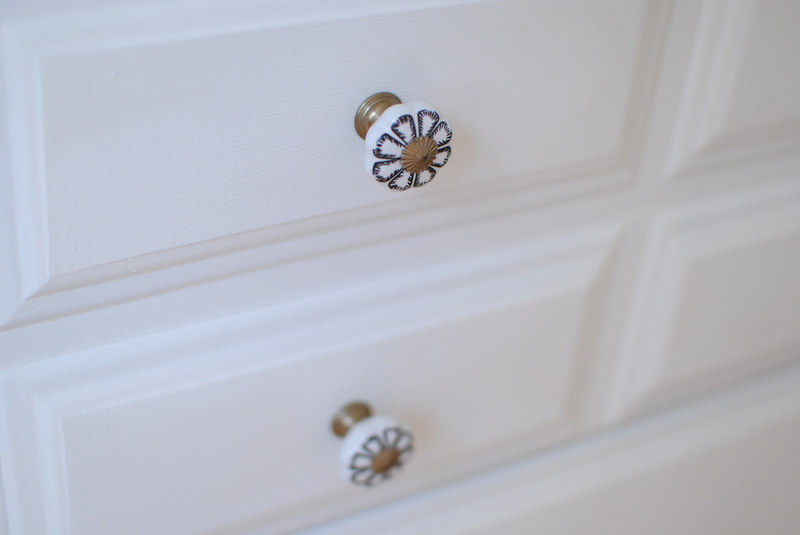 We had updated the handles when we painted it for Lola's room and I think they look just as good with this new coat of paint. 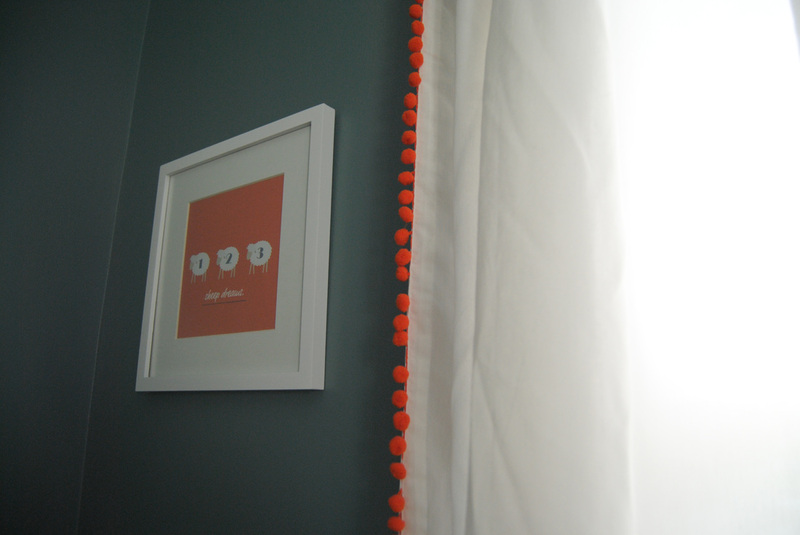 I stole two of my VIVAN curtains from my living room, sewed some lining to the backs of them to block out some of the light, and added some orange pom pom trim along the edges, which I found on Etsy. I just love the whimsical feel it gives the room! Speaking of Etsy, I found this little shop that carried these awesome string lights! Aren't they adorable? They even let me completely customize the color options so they match perfectly for the room. 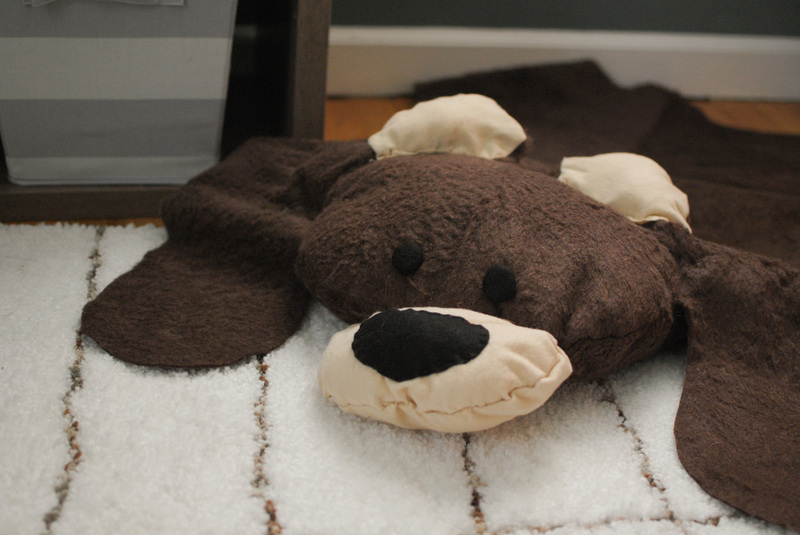 I plan on getting some for Lola's room too, maybe as a Christmas present. They work as a great night light and could definitely be used for all of those late night feedings as well. 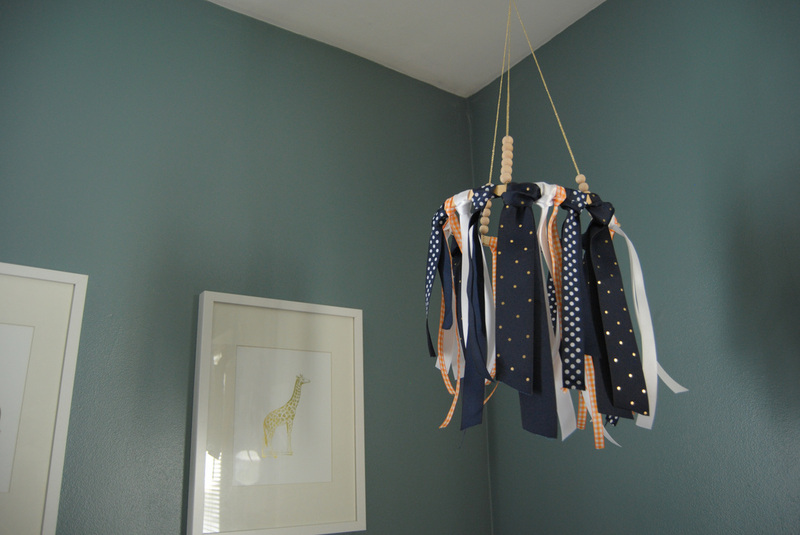 I made a few pieces of art for the walls and also made a cute little ribbon mobile for above the crib. My husband said it's borderline girly but I think it's okay since he's just a baby. The big "L" print is actually an engineering print I made and it only cost a few dollars to print. I already had the frame and just spray painted it white to match the others in the room. So that whole piece of art cost me less than $5! Does anyone else see a trend with my blogging habits? Well now that our precious boy is here and I am officially on maternity leave, I'm finding myself needing something to do for me that doesn't involve Carebears, dirty diapers or negotiating with a toddler. With my last pregnancy, I dealt with postpartum depression and learned a lot about myself and how I deal with problems that come my way. I learned how important self care is, especially after having a baby. If you don't take the time and care for yourself and invest in your needs every once in a while, it's easy to fall into a dark place. In all honesty, I forgot that I had started this little blog so long ago, but when I remembered it I thought, why not do this for me? 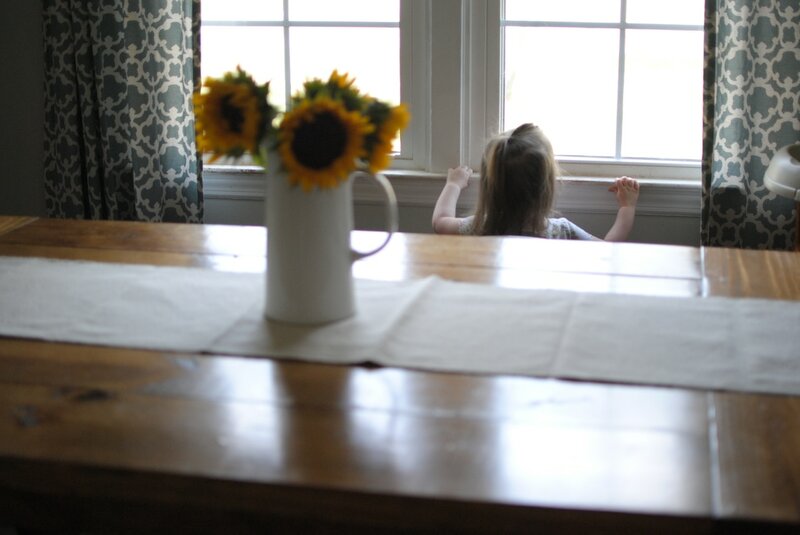 It could be my outlet to the outside world, to adults, because all moms know how easy it is for days to pass without leaving the house when you're home with a new baby. Now i've probably watched one too many episodes of Flip or Flop and Fixer Upper these past two weeks, but I can't help it, they are addicting. I have so many thoughts in my head and projects in my house i'd love to share, even if this does end up being more of a diary than a successful blog. So where to pick back up? How about a quick summary of the past 5 months: I finished (mostly) Lola's big girl room, decorated the nursery for the new baby, installed floating shelves in the kitchen, started on the board and batten in the living room, quit my job for something very part-time, oh and had a baby!! So stay tuned for posts about all of the above and more. I've got nothing but time on my hands. 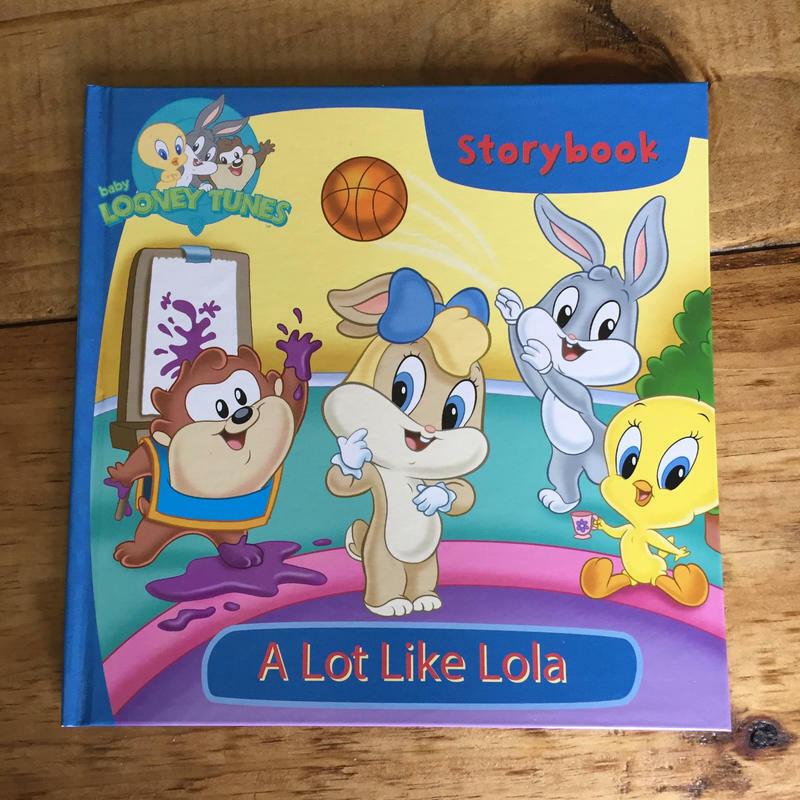 Since finding out we were expecting baby #2, due to arrive this summer, I just knew that we should make the experience extra special for Lola and move her to a big girl room and leave the nursery in the same location. I love any opportunity to decorate a room and this time it wasn’t just going to be in my head (anyone else constantly redecorate their home in their head? It’s much cheaper). Anyway, I'm pretty excited to get things started. Being a creative driven person I wanted a place where I could document my thought process and see how my ideas develop. That’s the main reason I decided to pick this blog back up (not sure you can even call it that since I only had one previous post, but you get the idea). 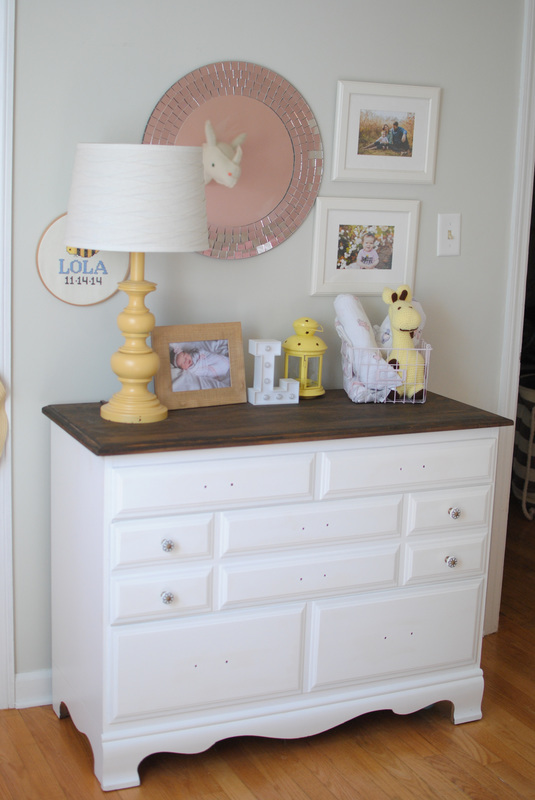 When I was pregnant with Lola I had a terrible creative block both at work with my design projects and at home when it came time to decorate her nursery. I think it took me 3 weeks to decide on a paint color. 3 weeks people! That is not normal for me. There were tears, a lot of indecisiveness and much frustration. This pregnancy is already so much different, but in case the creativity block hits me again I want to have my ideas documented so I don’t have to pull out my hair trying to decide what curtains make the most sense in this space. 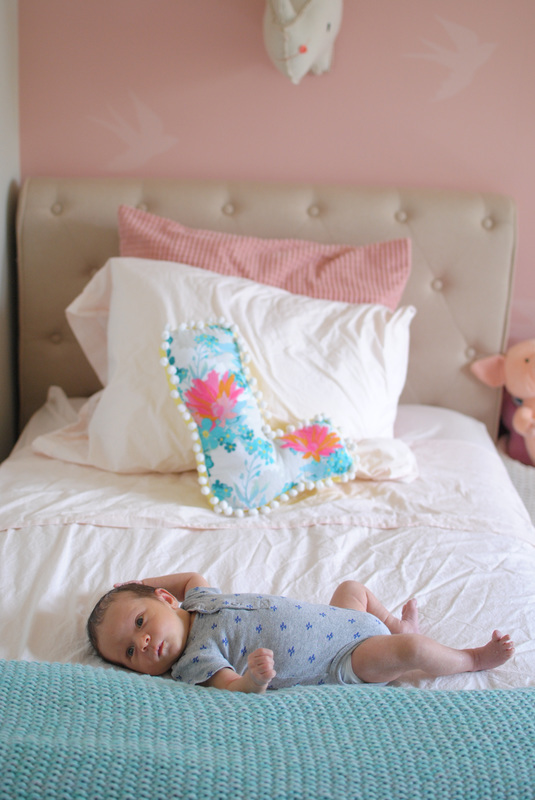 I saw Pantone’s color of the year (Rose Quartz), it was so pretty and girly, and knew that I wanted to incorporate it somehow in Lola's new room. That was my starting point. Though she’s a big fan of My Little Pony and Mickey Mouse, I wanted to create a space that would last through the years and just accent it with the things that she loved now, which could easily be changed out when Pinky Pie gets replaced by Dora. I think my color palette will be tan (the walls are already painted Benjamin Moore's Going to the Chapel), pink, cream, gold and grey. Girly and fun, just like my Lola. ​Since we need to use her crib for the baby, we are going to transition Lola to a twin bed. I thought about getting a toddler bed, but it seems a little pointless to me since she would only be in it for a few years before we needed to buy a larger bed. I don’t want to spend a ton of money on a bed frame, but at the same time I would like something a little more substantial and lets be honest, attractive, than just a metal frame. 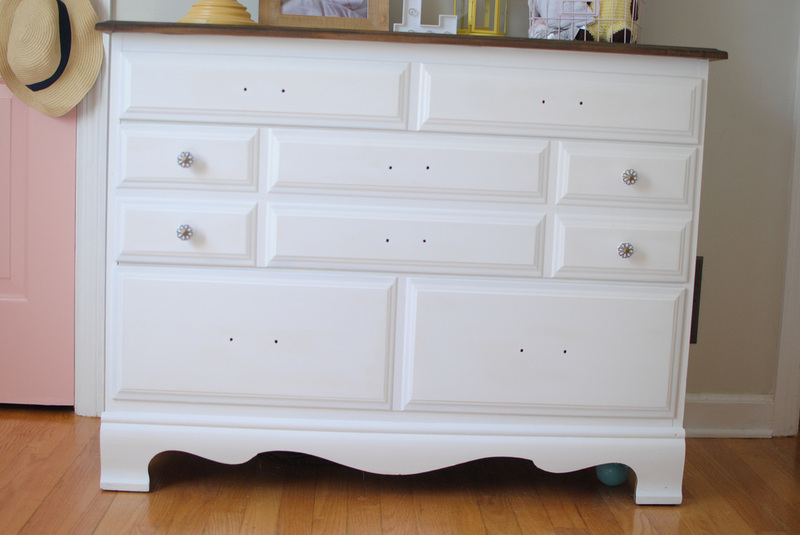 I would love to find an old Jenny Lind style bed that I could paint, but so far I haven’t had any luck on Craigslist. I came across this little number at Target which I love, but I have a few reservations. It’s the perfect color for my palette, but the way the top curls back worries me how far it would make the bed stick out from the back wall and if that would look strange? It also costs more than I wanted to spend at $180 (free shipping though). Since it has slats we wouldn’t need to buy a box spring, so that’s a plus and would save us some money. I’m not 100% sold on this though, maybe if there is a good sale or Cartwheel offer I’ll jump on it. Otherwise I’ll keep scrolling the depths of Pinterest for something I love. Here are just some of my other wondering thoughts for the space, I’m sure they will change as I start to buy things and get the room set up.